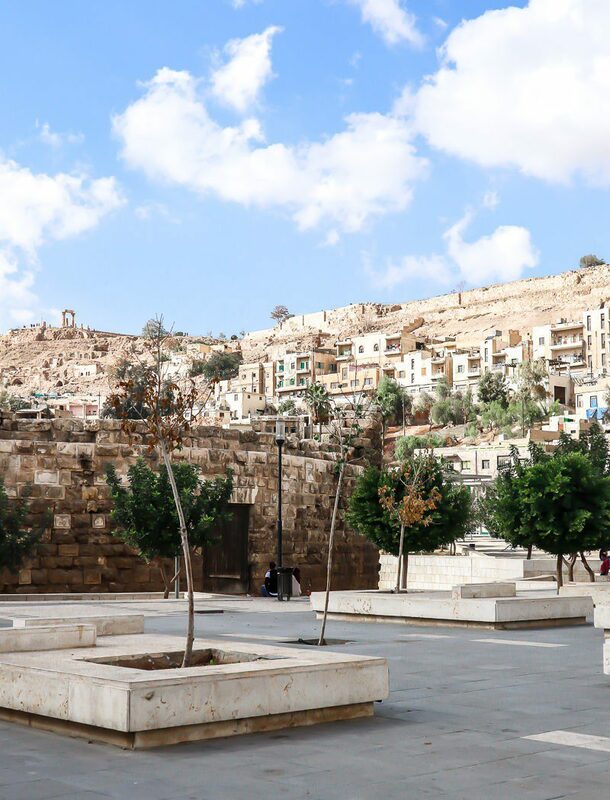 Many tourists visit the Hashimite Kingdom of Jordan for the sake of Dead Sea, Petra and Wadi Rum – but don’t forget about the capital of Jordan because it’s worths a brief visit as well! 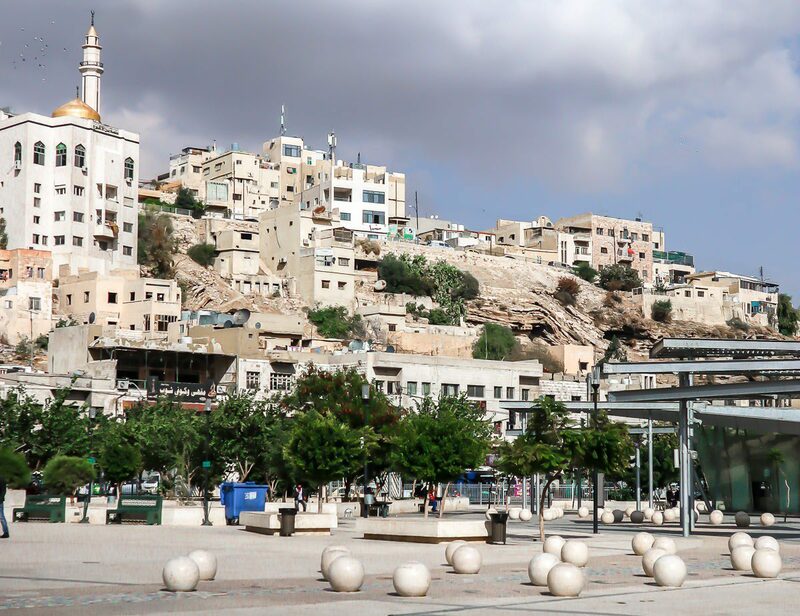 You get your visa at customs immediately upon your arrival. 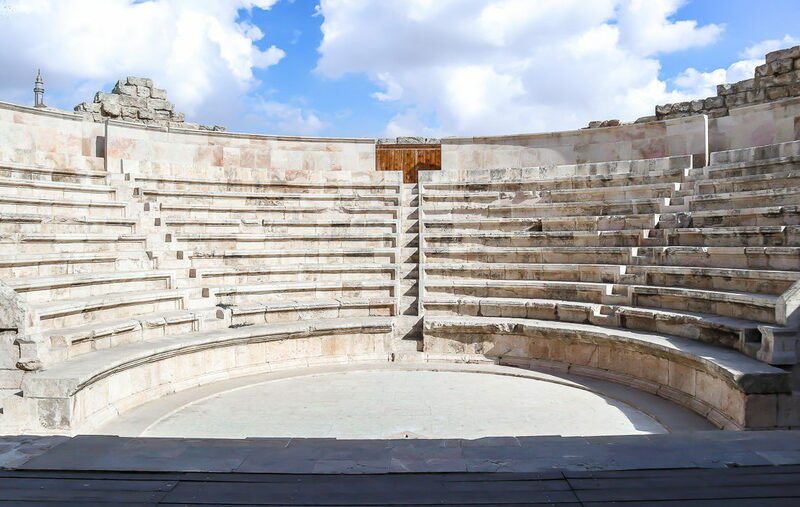 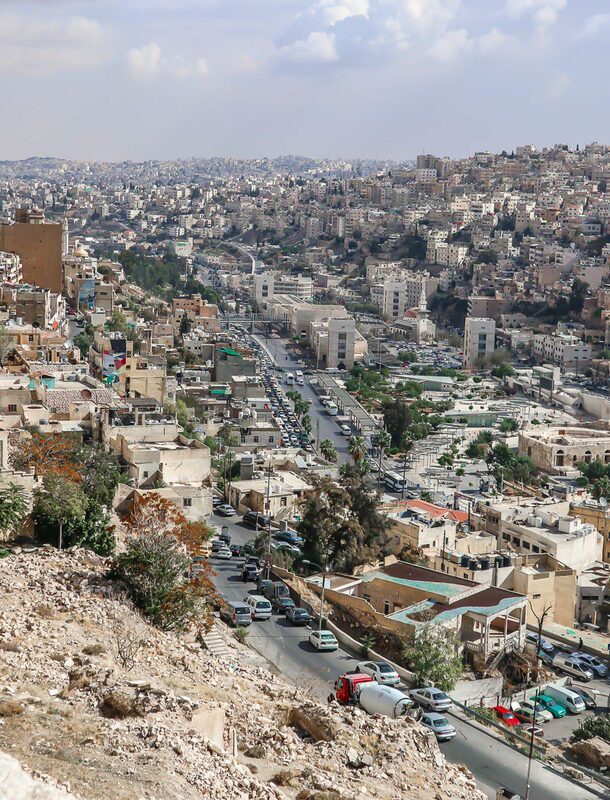 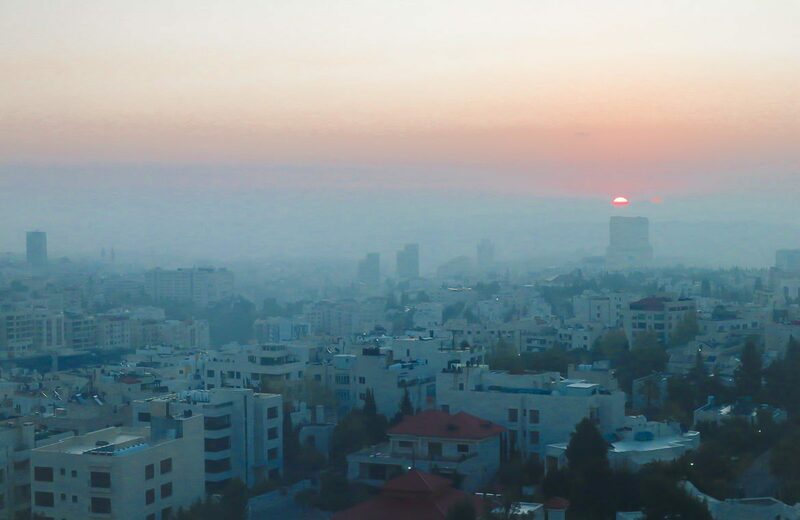 As for the transport – Amman covers several really high hills, and its touristic spots are dispersed over the city and require you to go up and down. 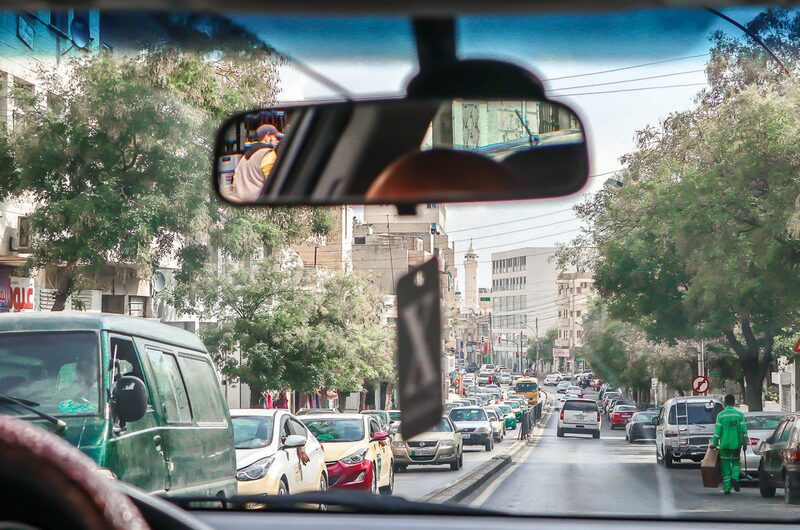 So I would suggest you to hire a car or a guide with a car, it would dramatically ameliorate you time in there! 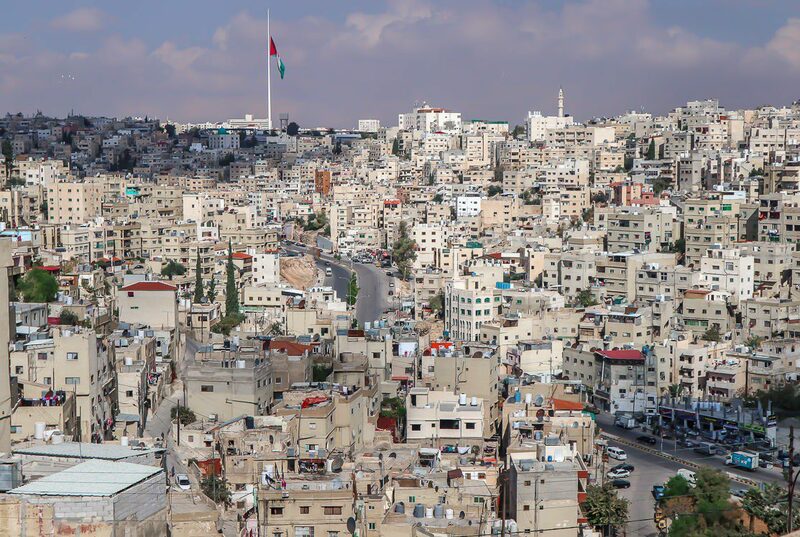 I must admit that Amman was much friendlier and welcoming than I expected. 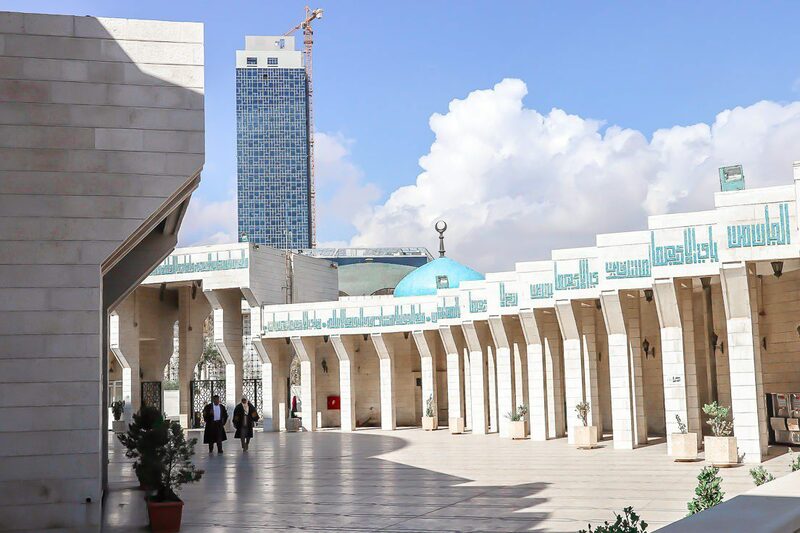 A fabulous modern mosque famous for its huge blue dome is a rare mosque in Amman where you can freely enter as a tourist. 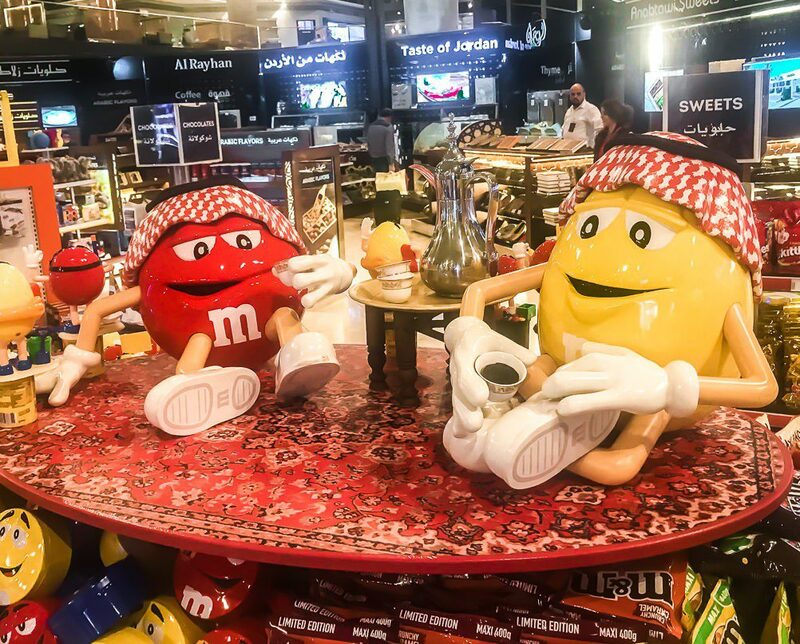 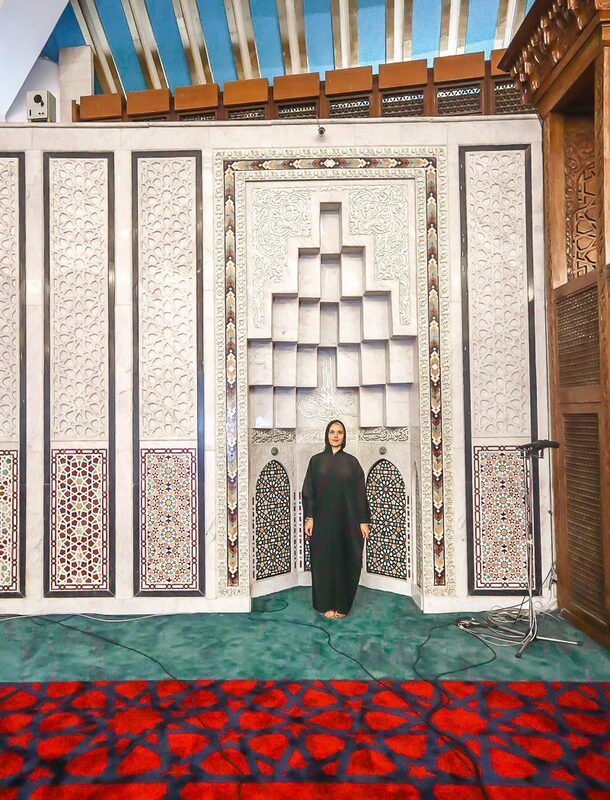 There is a special entrance for non-Muslim visitors with several shops, ticket counter and a room where women can borrow an abayas (long black dress covering all the body and hair – does it suit me? 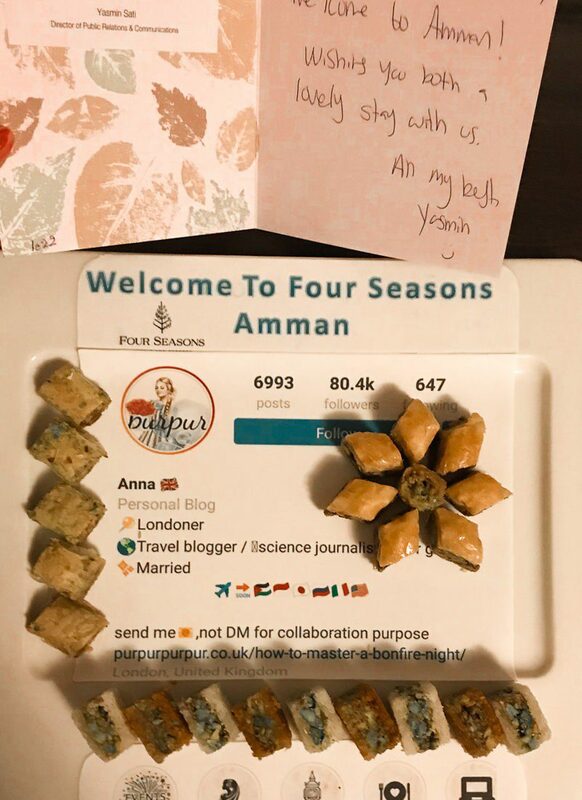 🙂 ) for free. 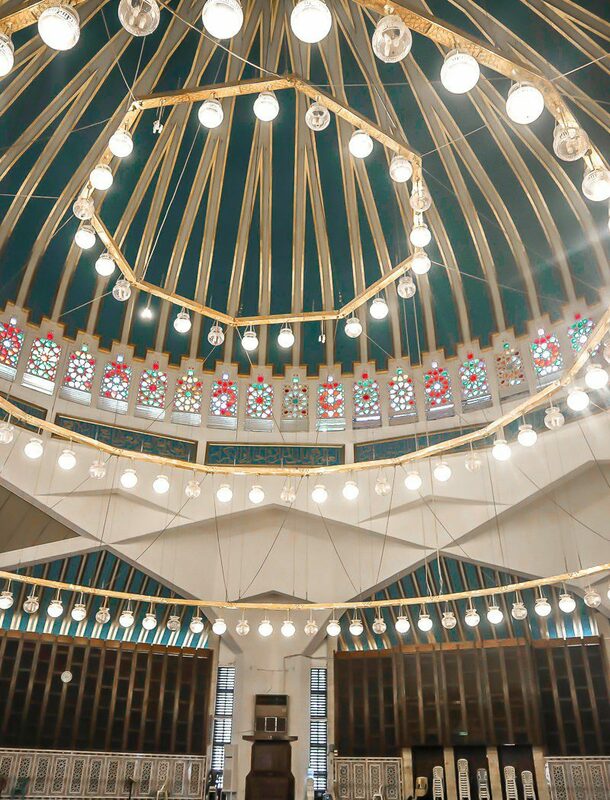 When entering any mosque, don’t forget to take off your shoes first! 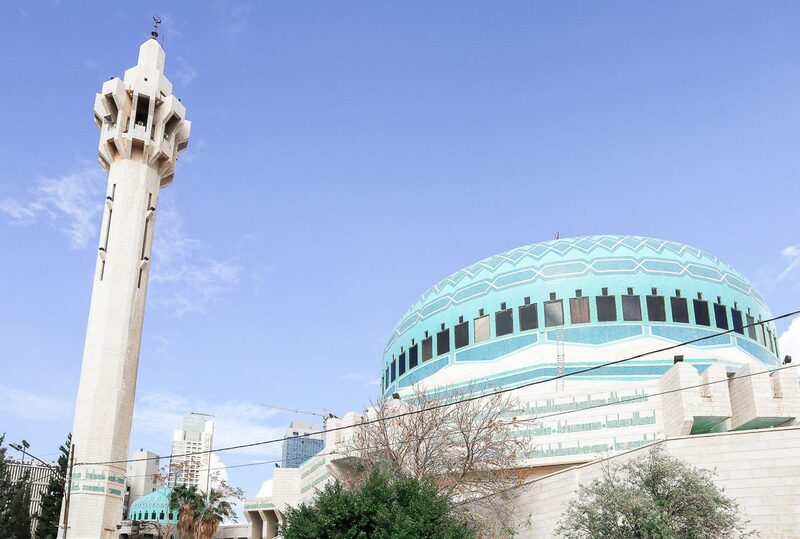 King Abdullah I Mosque was built in 1980s by the order of the late King Hussein to commemorate his father King Abdullah I who was assassinated in Jerusalem in 1951 by a Palestinian. 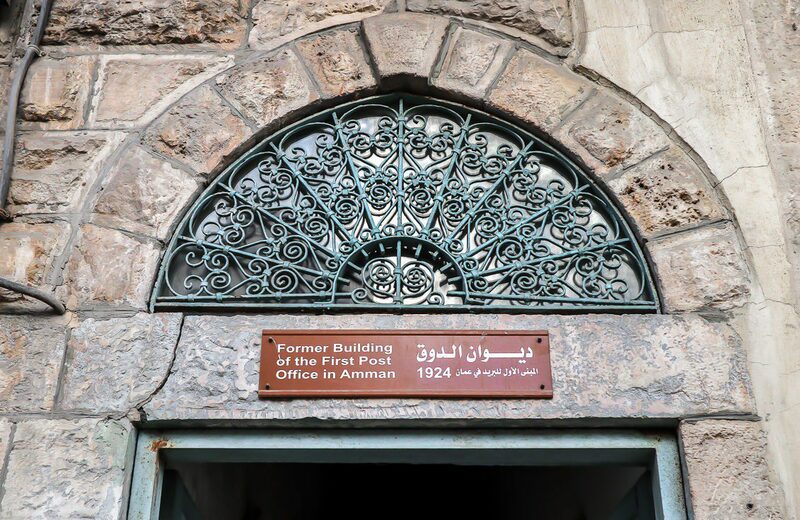 King Hussein, then a Prince, was by the side of his grandfather that day and almost miraculously survived the shot aimed at him. 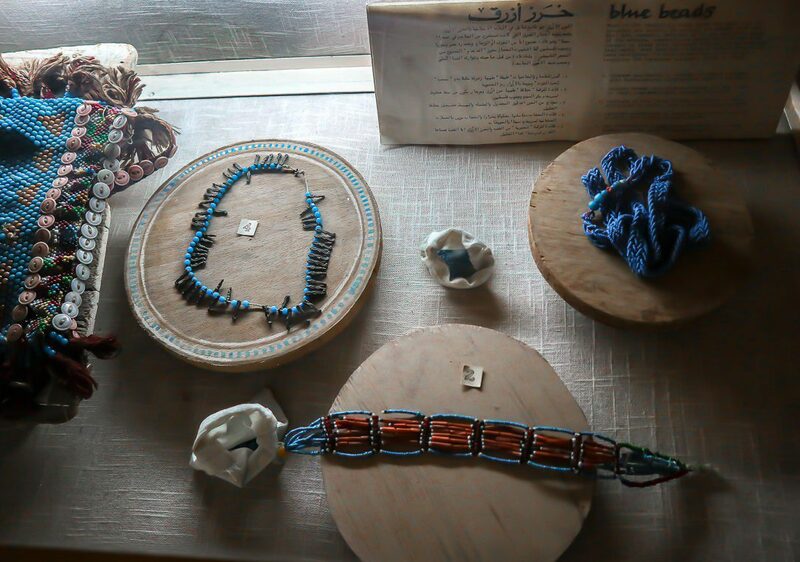 Discover photos and various artefacts at The Islamic Museum at the mosque complex as well. 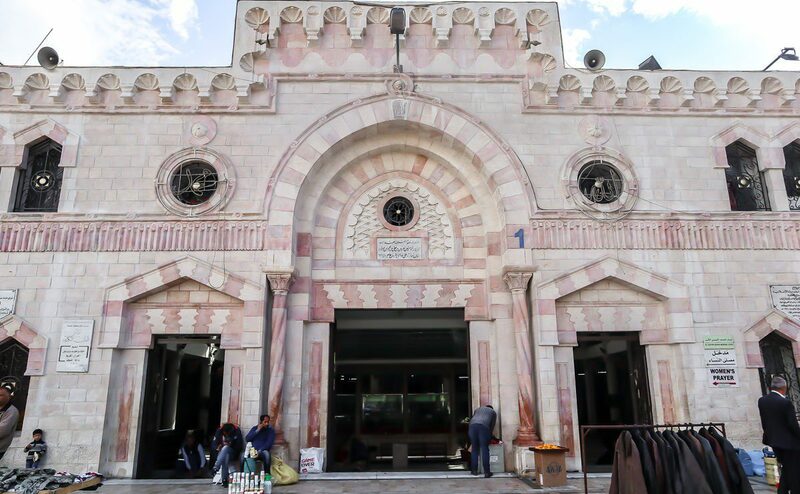 Tip: Check times of prayers before you plan your visit! 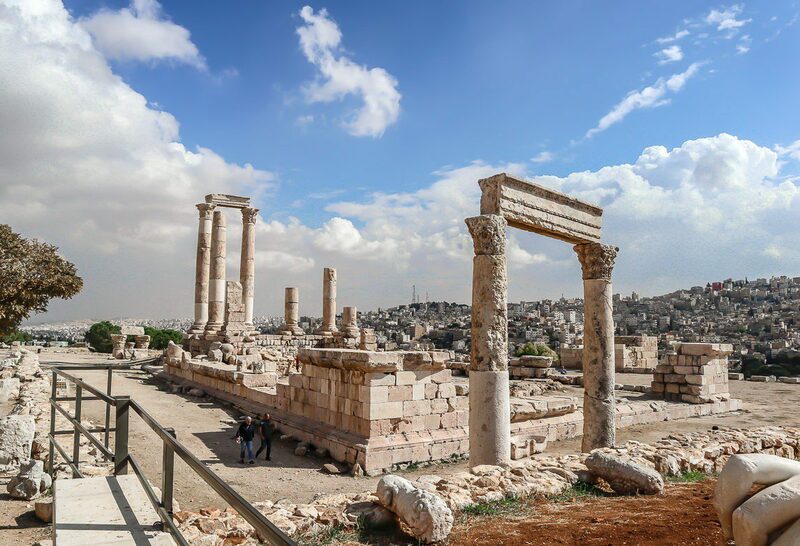 Amman Citadel is without doubts the most historically rich location of the Jordanian capital – actually it’s considered one of the oldest places people ever lived in! 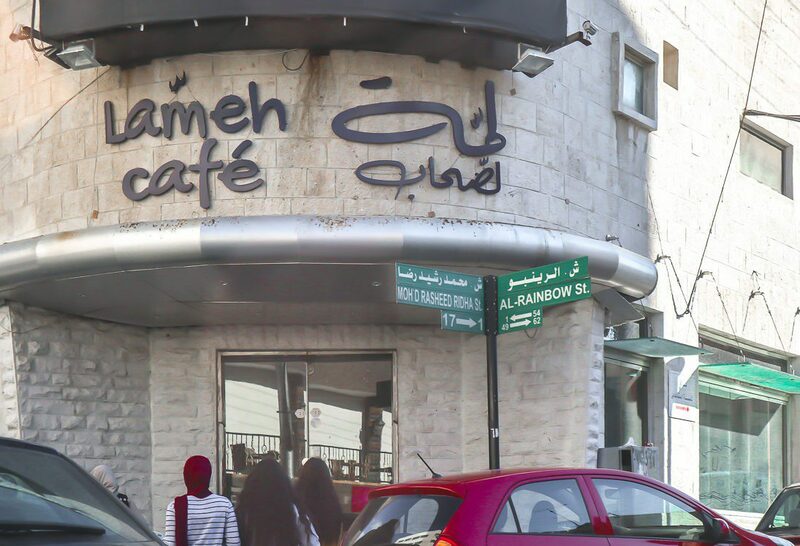 It was known under many names: Rabbath-Ammon, Philadelphia and finally Amman. 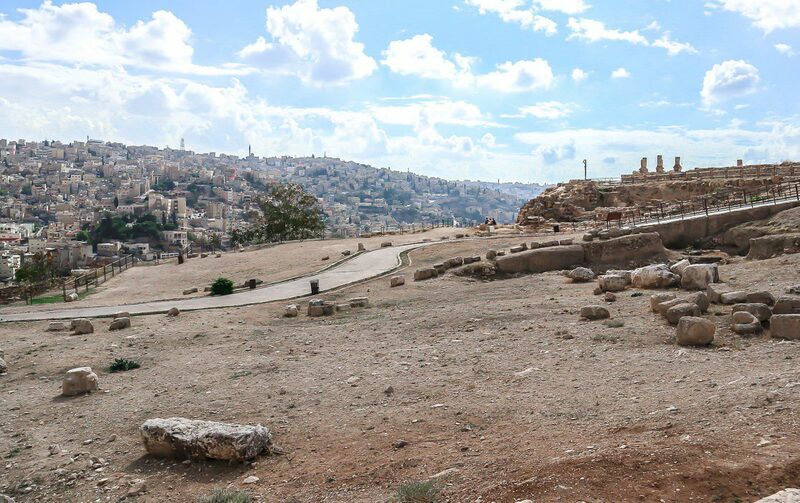 Sitting right on the top of Jabal al-Qala’a, one of the seven hills, it shows you the whole perspective of Amman inhabitants for many centuries: from the Late Stone Age through Perses, Nabateans, Romans, Byzantines and up to the Umayyads. 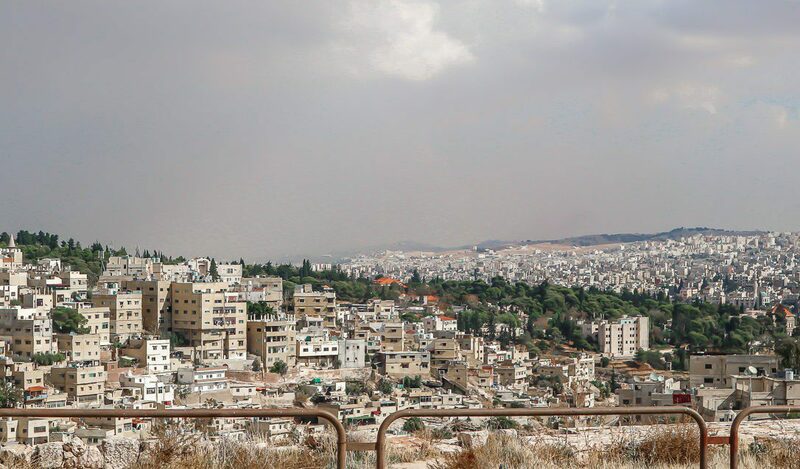 Panoramic views of the modern city from the Citadel are also astonishing. 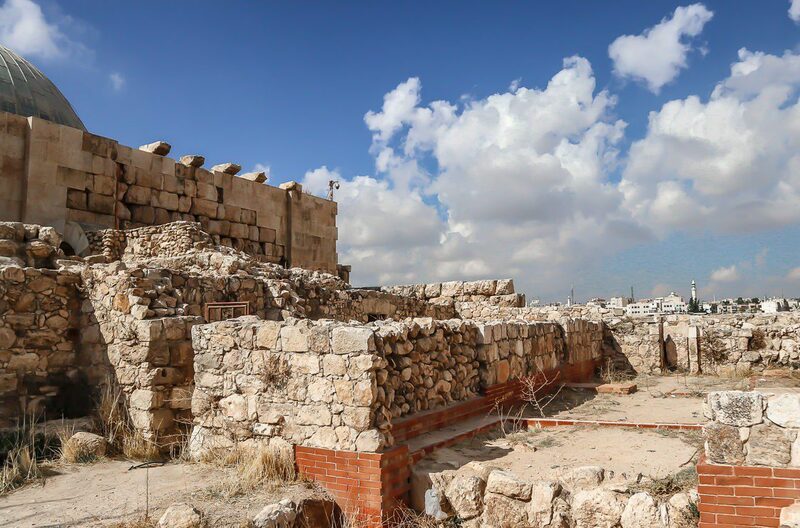 The whole hill is blanketed with ruins among which are several spot you must not miss. 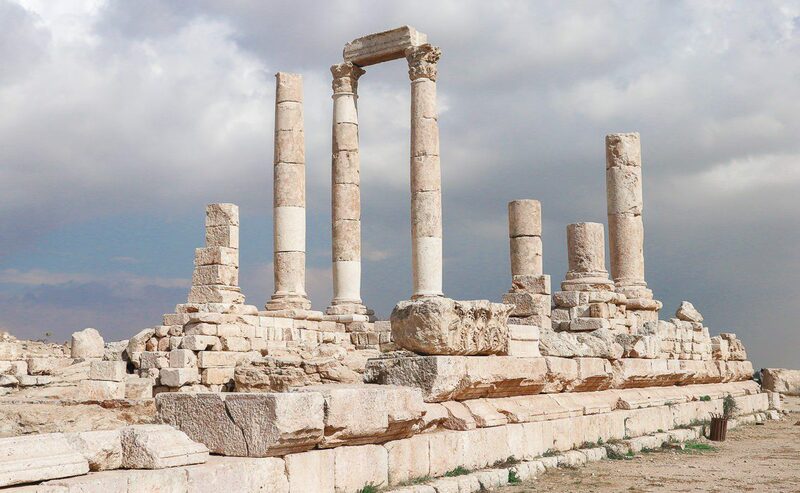 The most notable remnants from the downhill come from Temple of Hercules of the 2d century AD. 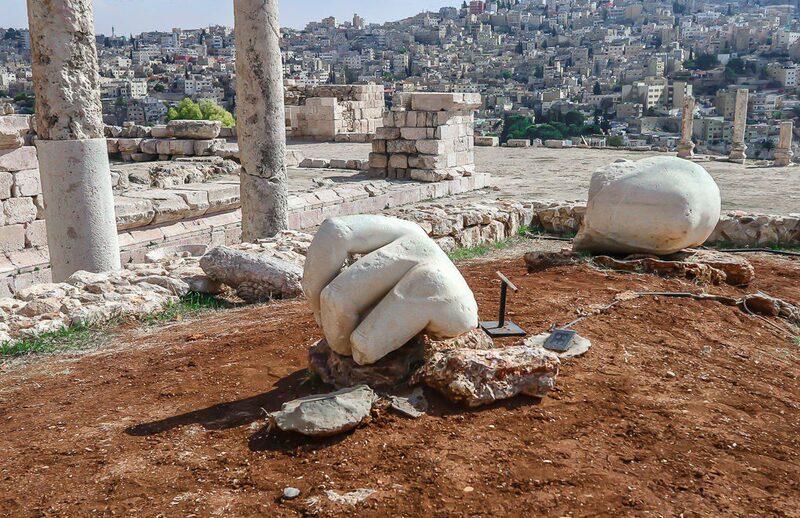 Pay attention to the hand and elbow fragments of a famous Antique hero! 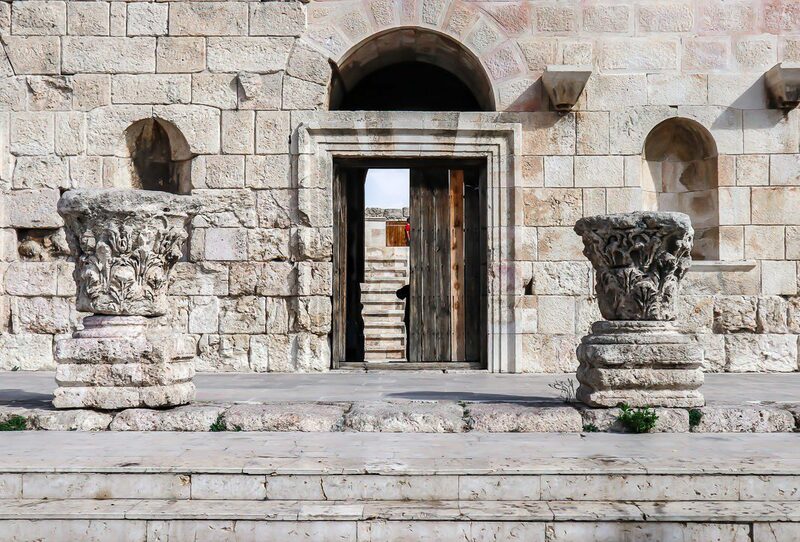 Byzantine church of 6-7 centuries BC although being heavily affected by earthquakes still contains some pretty mosaics. 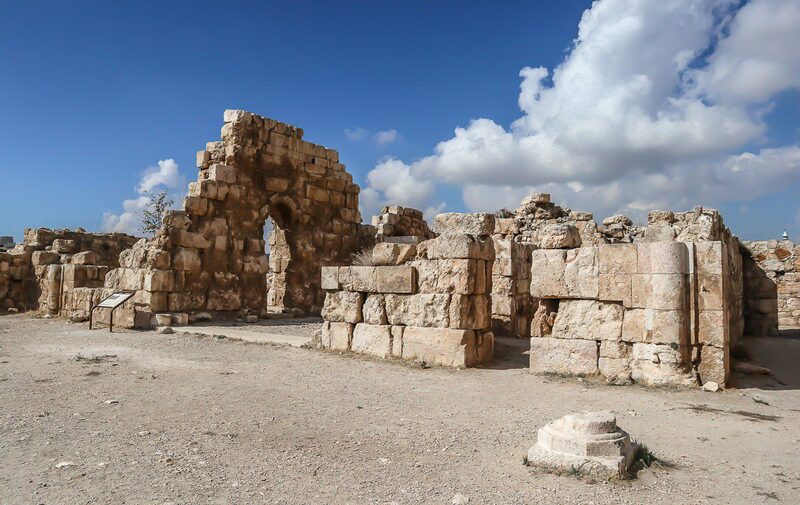 The Umayyad Complex from the 8th century AD once was a palace of the local ruler and now is probably the most impressive location inside the citadel. 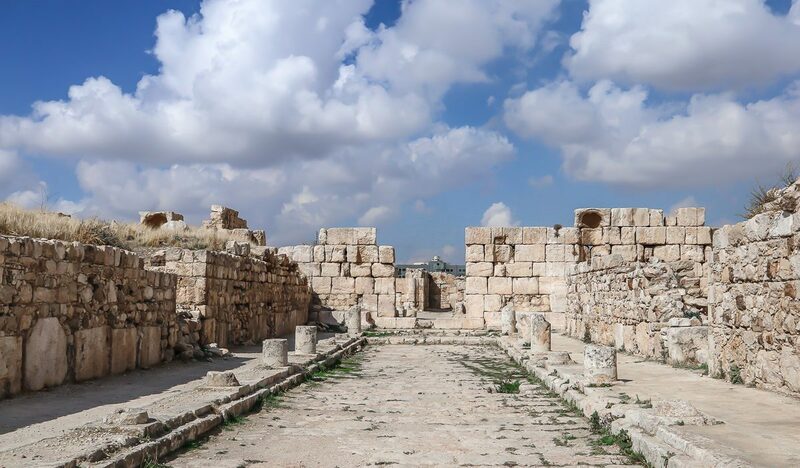 The water cistern, colonnaded streets, remnants of palace, residential buildings, hammam, market and mosque are really impressive. 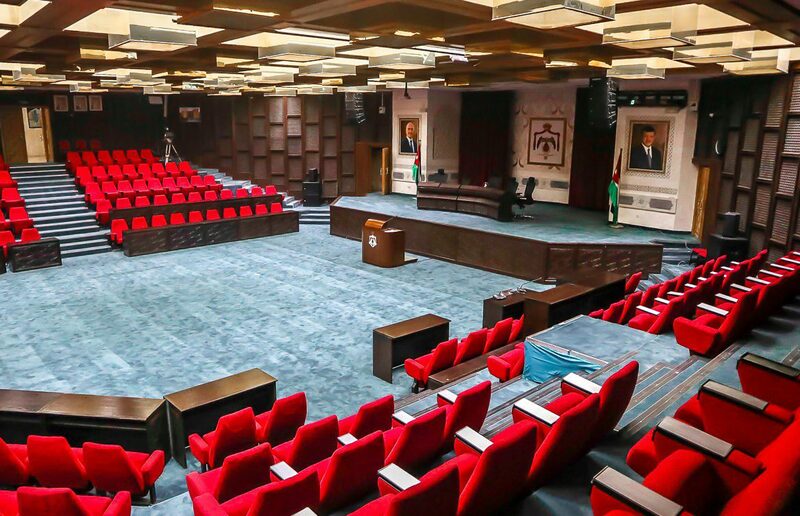 Of course, the main building of them all is an Audience hall, or the Iwan. 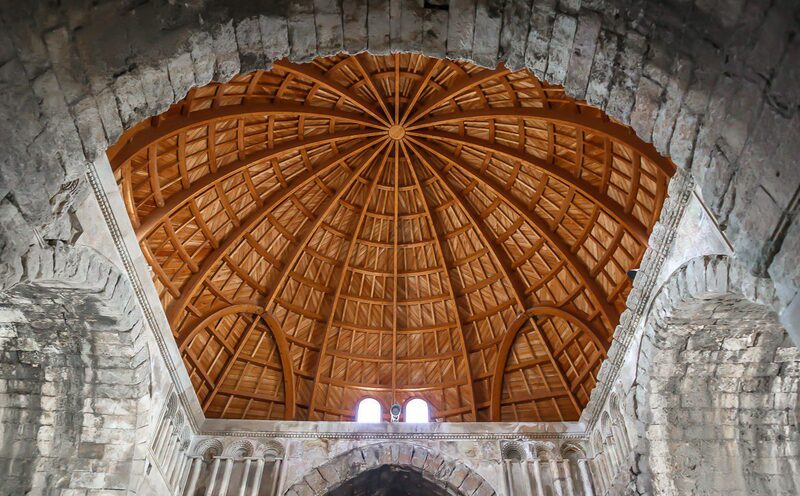 Its dome was recently rebuilt in wood – some historians are not amused by this idea but I must admit this is looks really amazing! 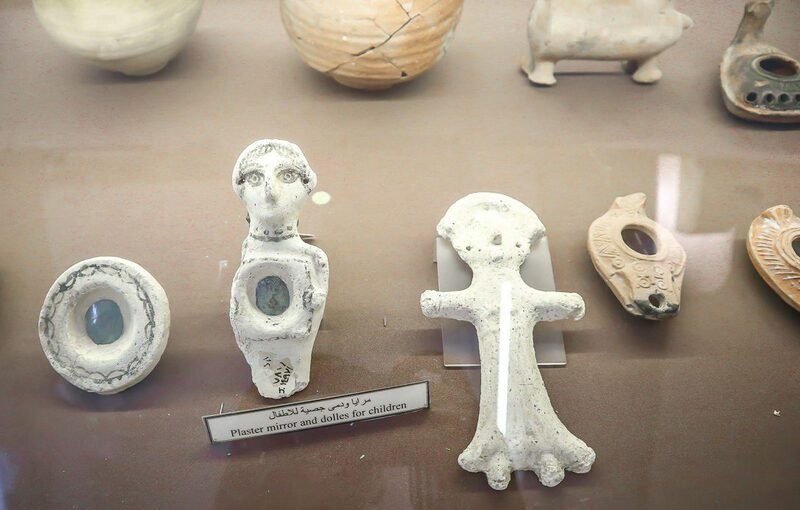 There is a tiny Jordan Archaeological Museum in the Citadel as well. 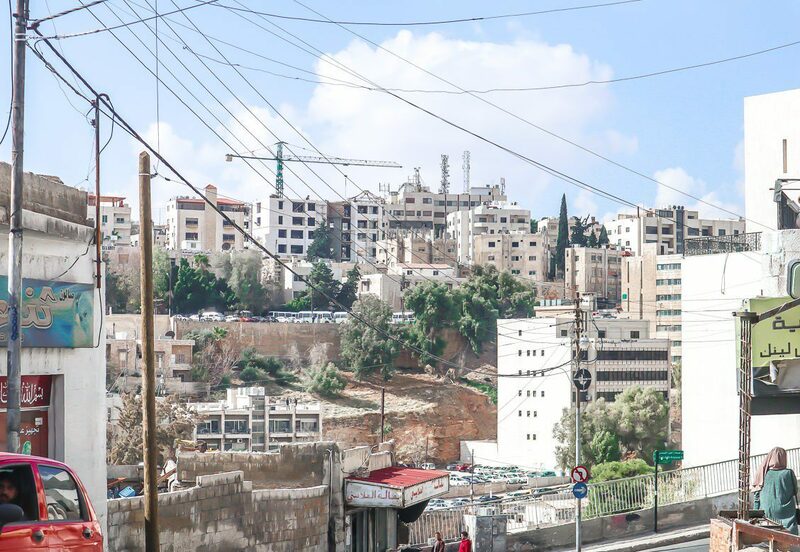 From the citadel I was able to spot an impressive Abu Darwish Mosque on the Jabal al-Ashrafieh, one of Amman hills. 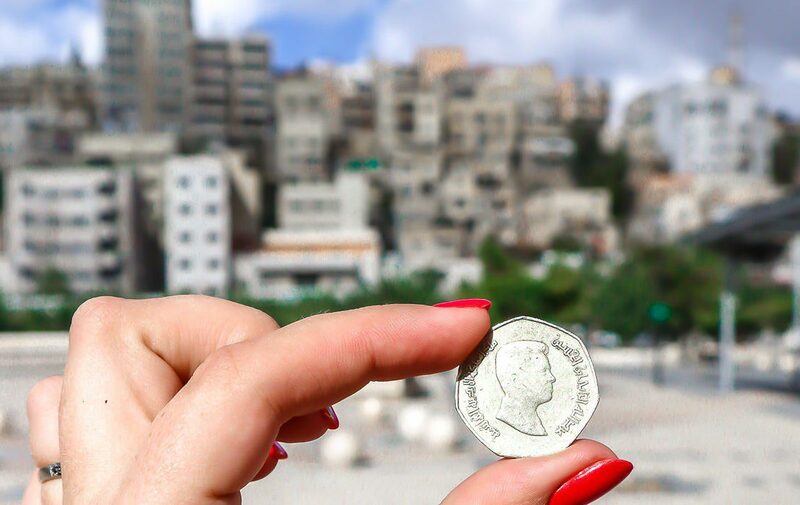 Even from a distance its black and white design looks so impressive (although my photo doesn’t reflect it at all)! 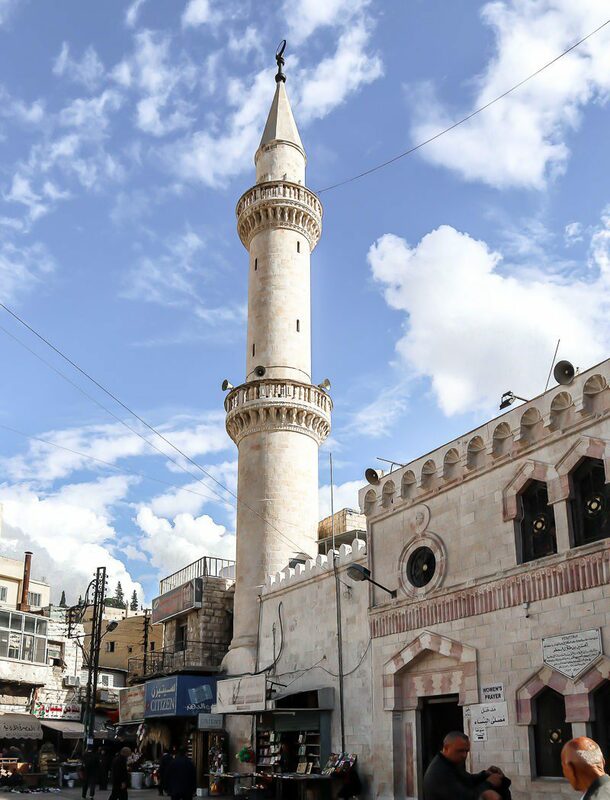 Actually it’s not so much to see around Abu Darwish Mosque so you can just enjoy its exteriors from the Citadel or any other high point of the city. 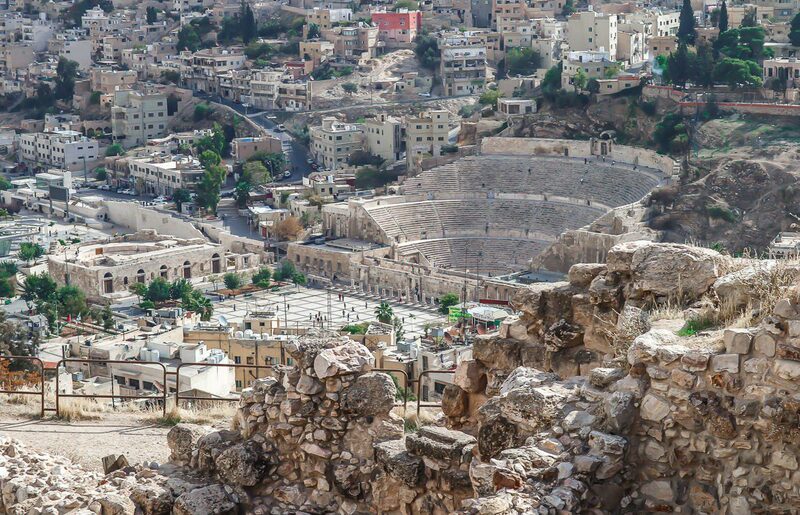 If you look from the Citadel, Roman theater built in the 2d century AD is hard to miss! 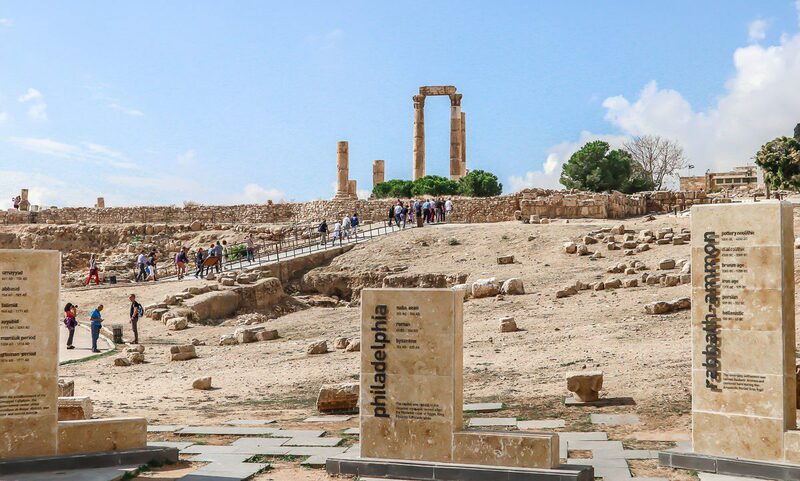 What a better reminder of ancient Philadelphia’s heritage could there be? 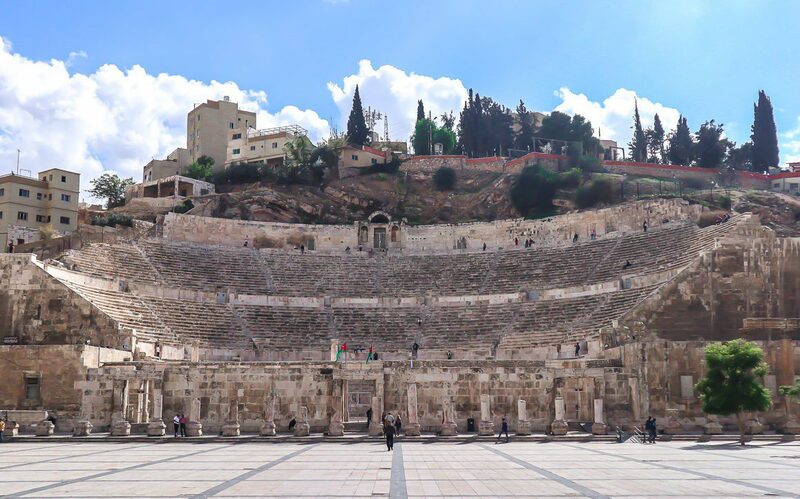 Actually there are two theaters just side by side: the smaller Odeon theater and bigger one. 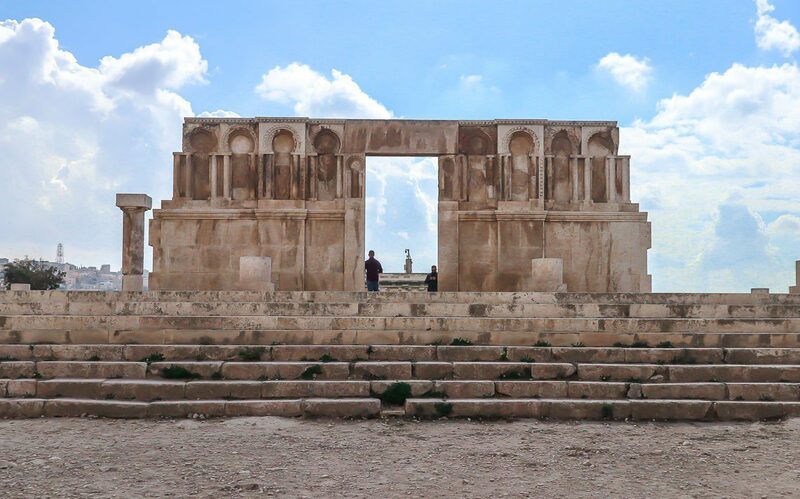 Both were restorated – not exactly precize from the archaeological point of view but looking really dramatic anyway. 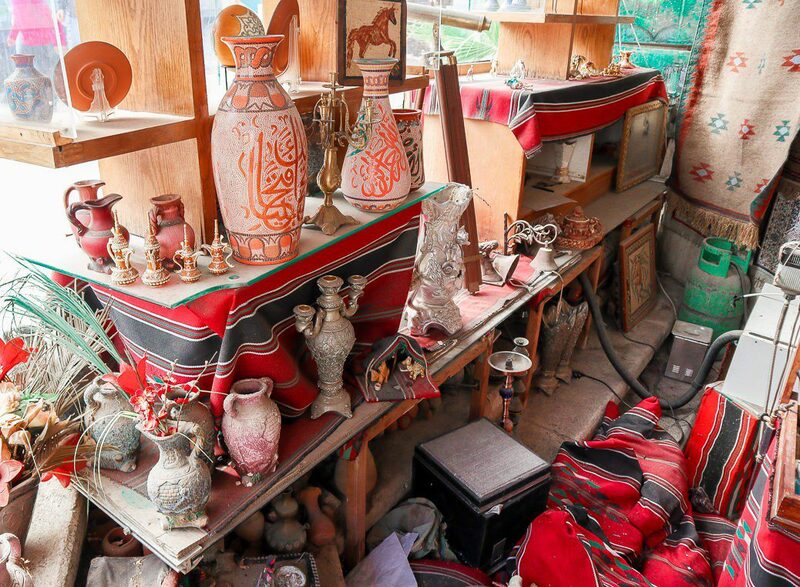 When exploring the bigger one cut right in the hill, look on both its sides – there are tiny Jordan Folklore Museum and Museum of Popular Tradition! 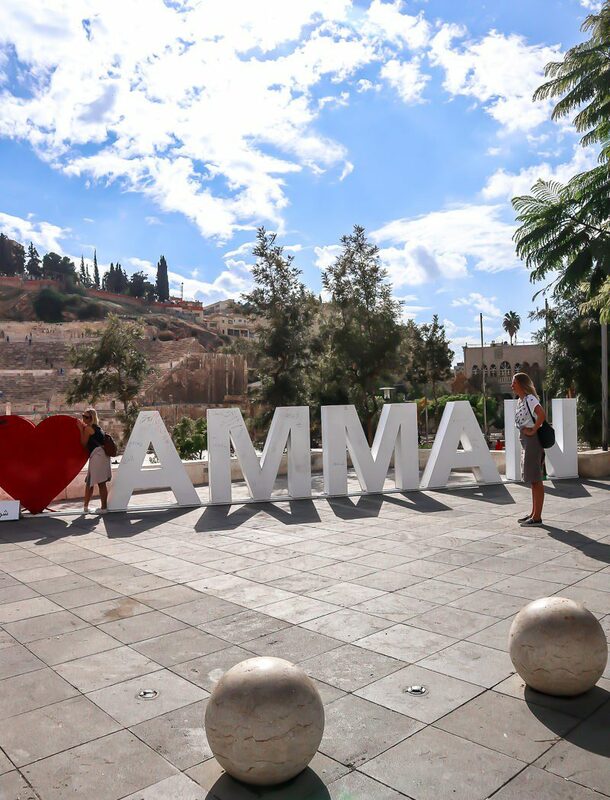 Tip: if you have a lot of time, pop into the Jordan Museum, the largest museum in Jordan, and see many ancient artefacts from Amman’s history! 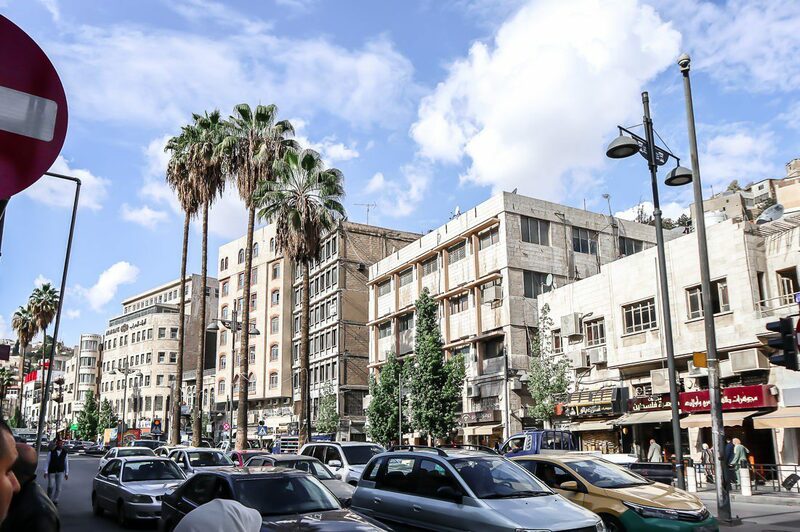 Al-Balad is the ancient downtown which inevitably attracts both tourists and locals. 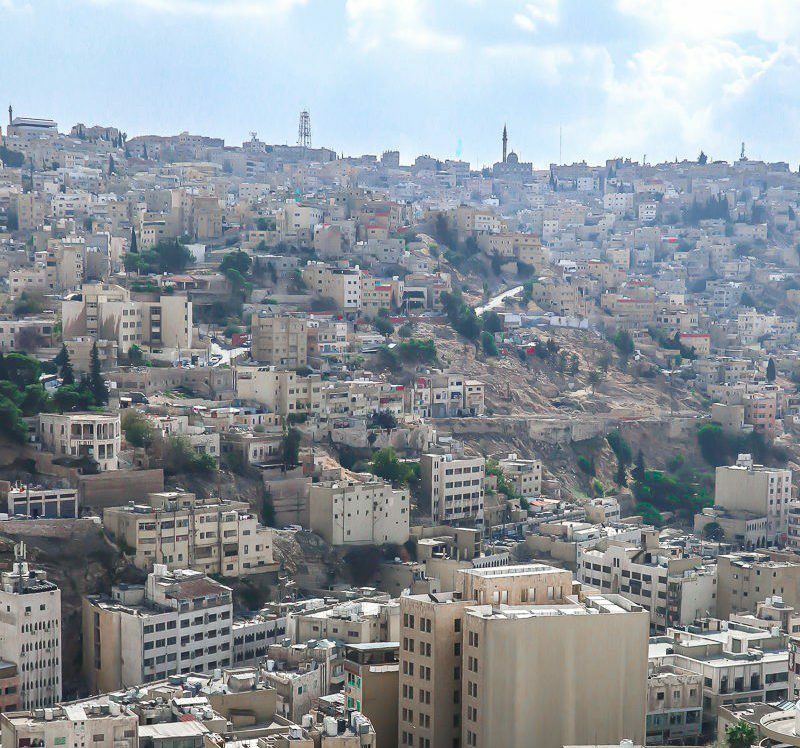 This area of Amman has been inhabited for thousands of years. 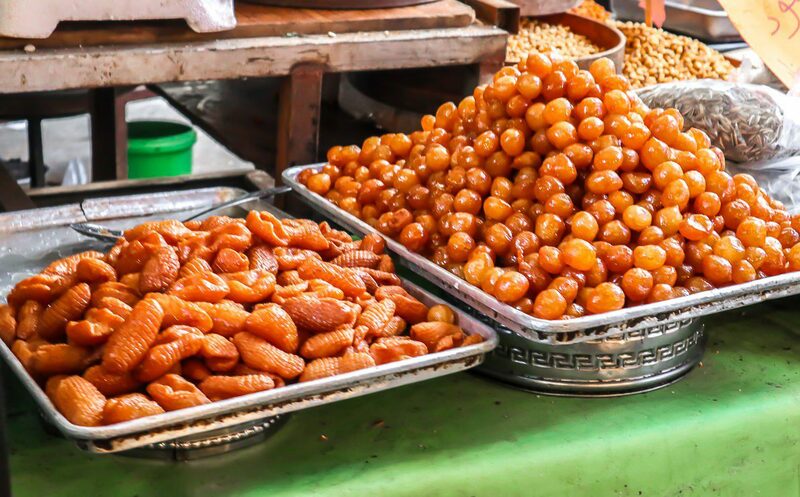 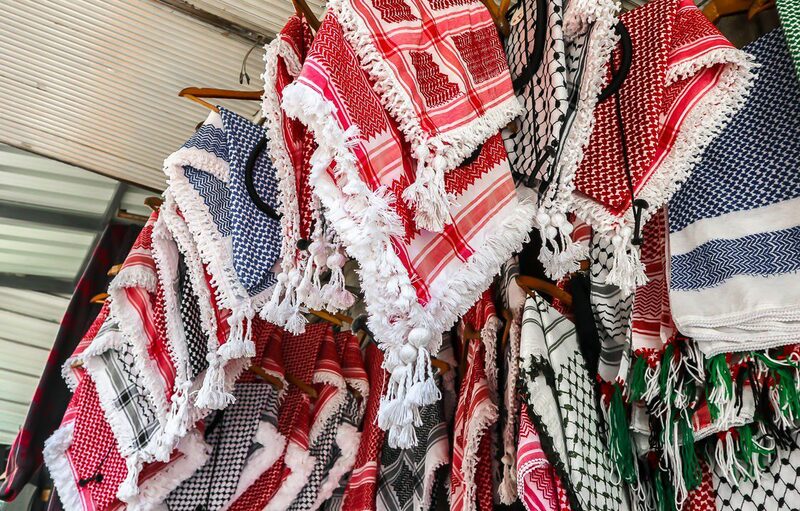 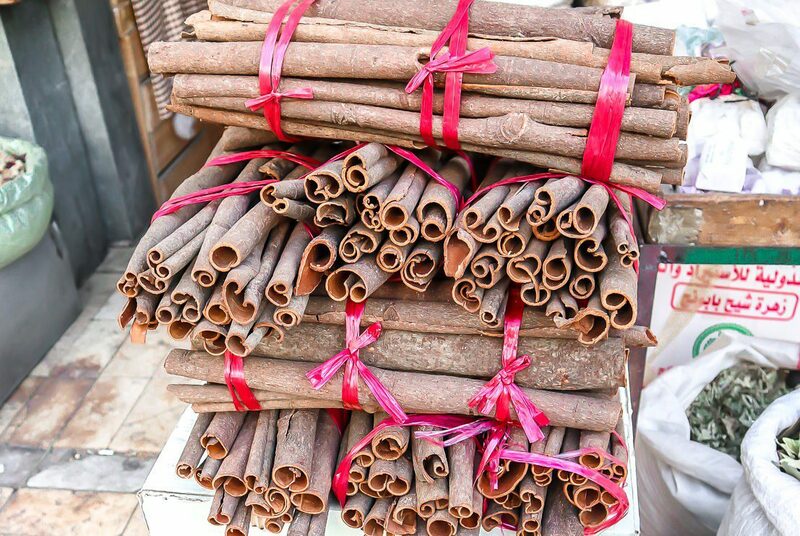 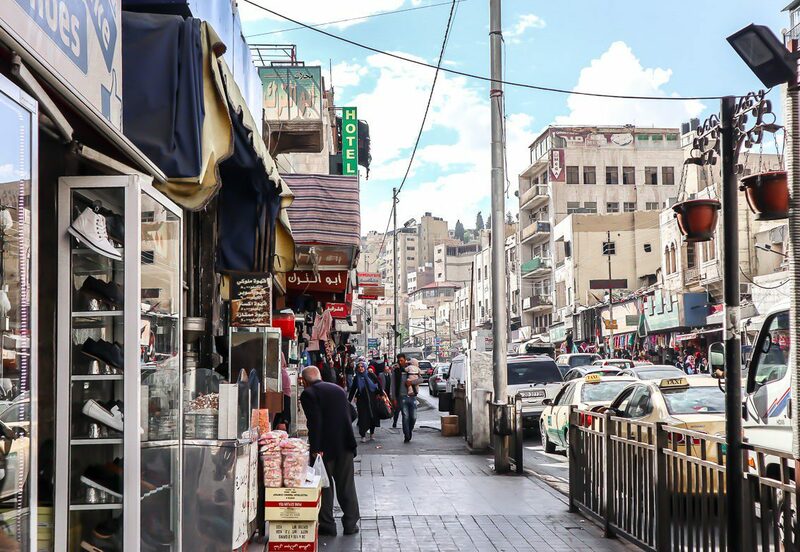 Now you can stroll along several markets – or ‘souk’ – closely packed in around there – sometimes it’s even hard to trace when one becomes another! 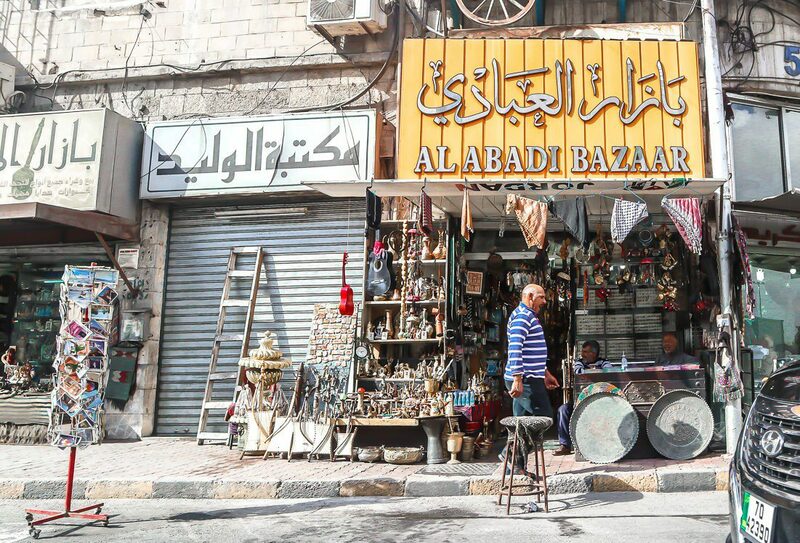 Tip: please note that many shops are closed on Fridays! 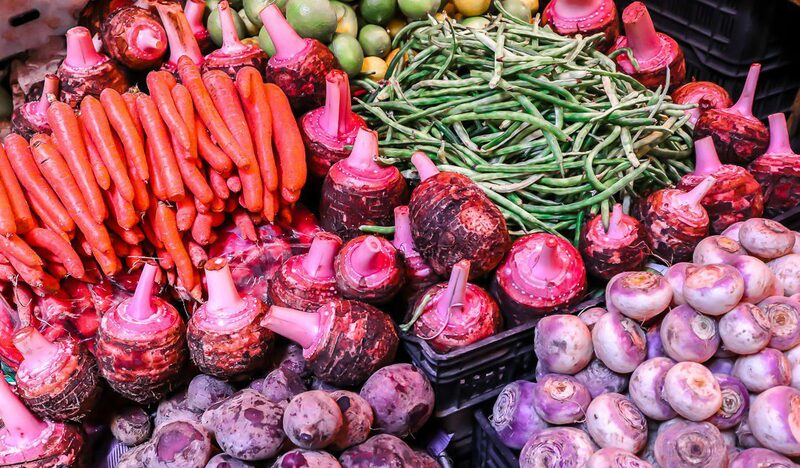 I must note that vendors are super-friendly, offering you to try everything you want are happy for their tills to be photographed! 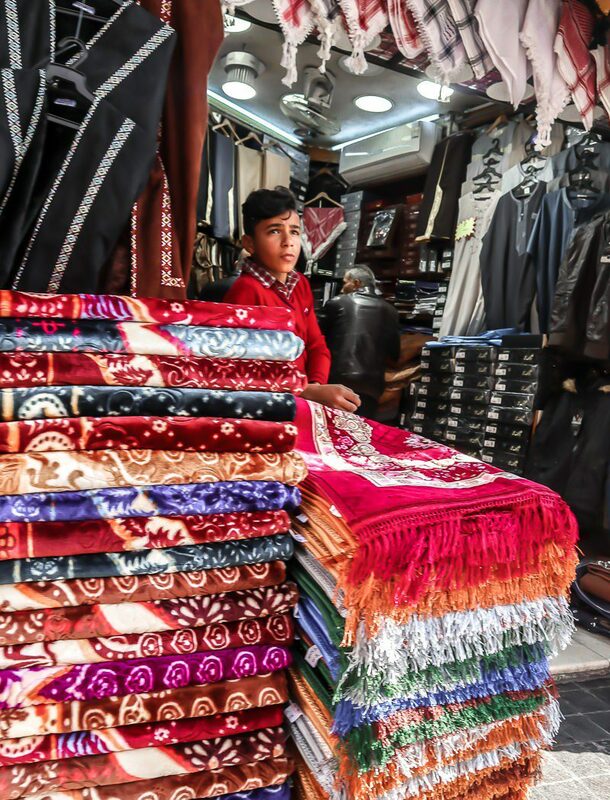 I was also advised to bargain for the best prices – so, if you’re good in negotiating, go ahead! 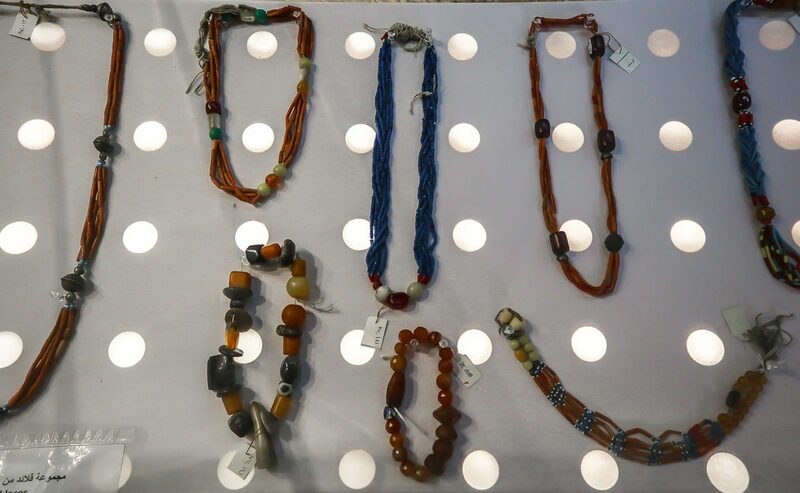 Many touristic souvenirs, however, are not local and are made in China, but of course you can still buy them if you want. 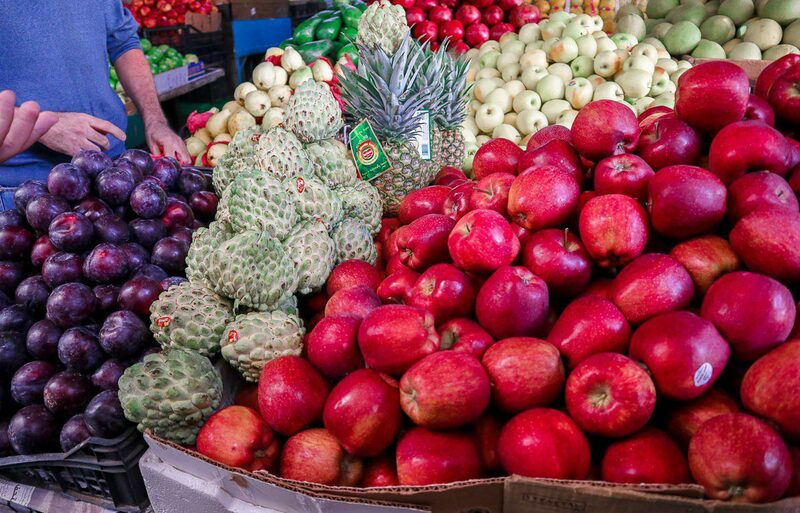 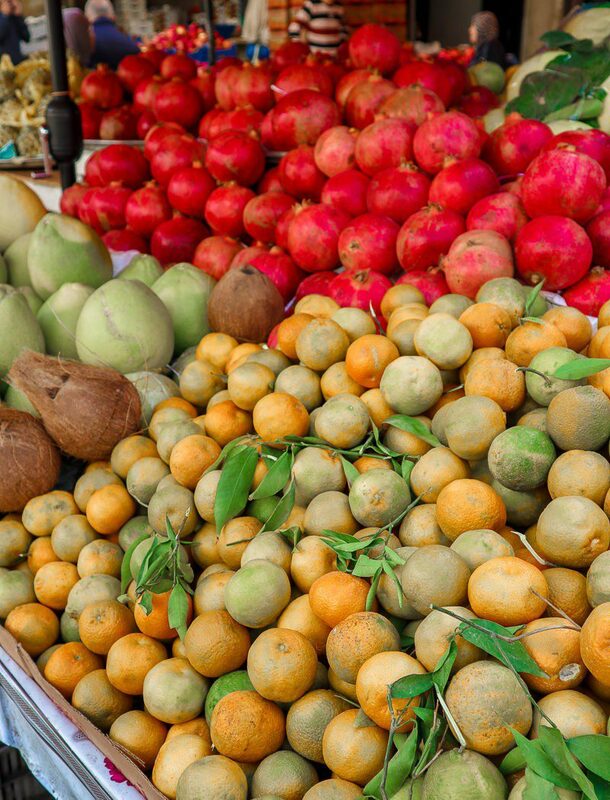 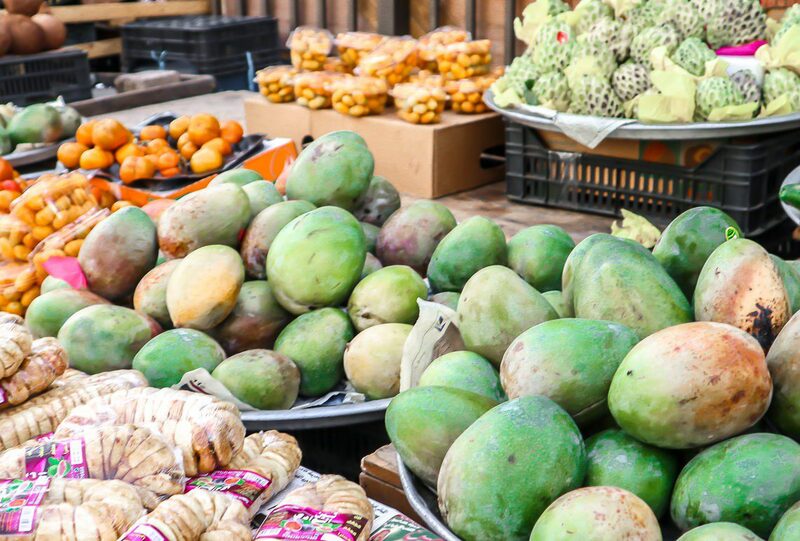 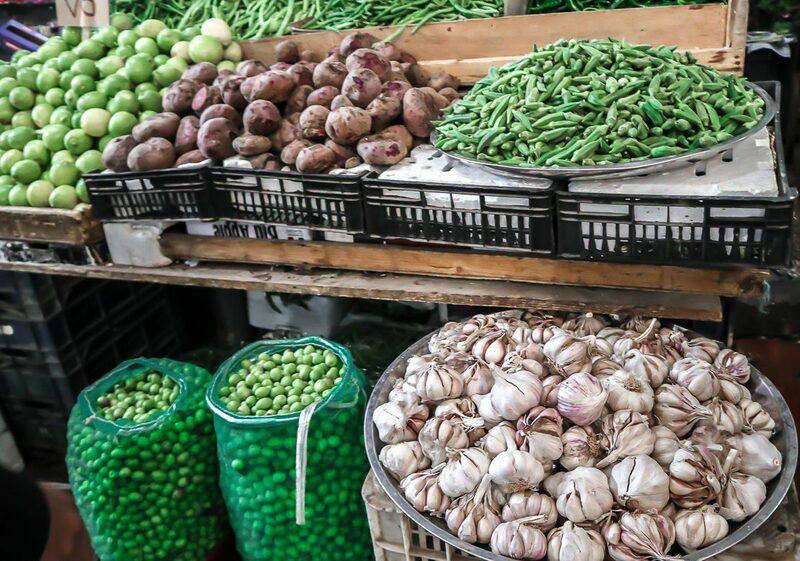 Souk el-Khodra offers you a wide range of fresh vegetables and fruits, both imported and domestic! 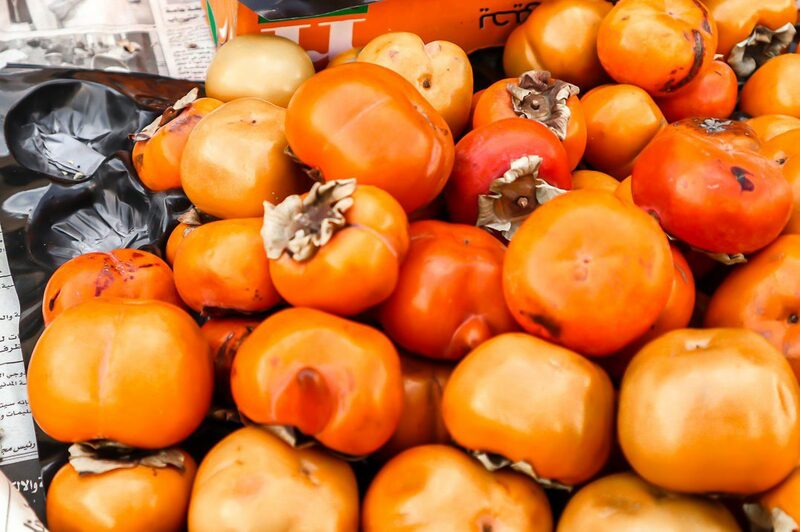 Local persimmons, little bananas, dates and grapes are simply delicious. 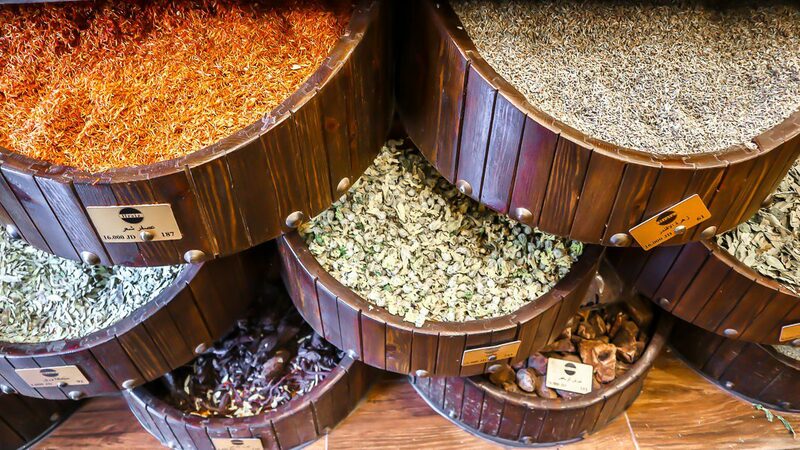 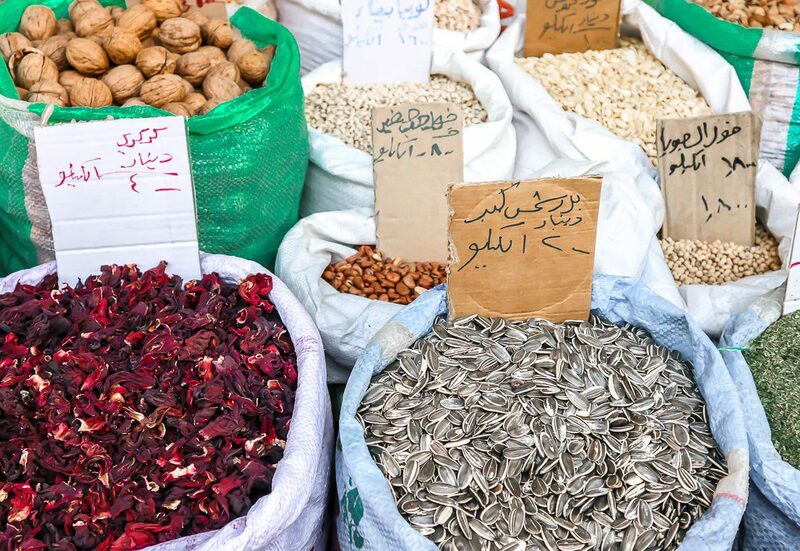 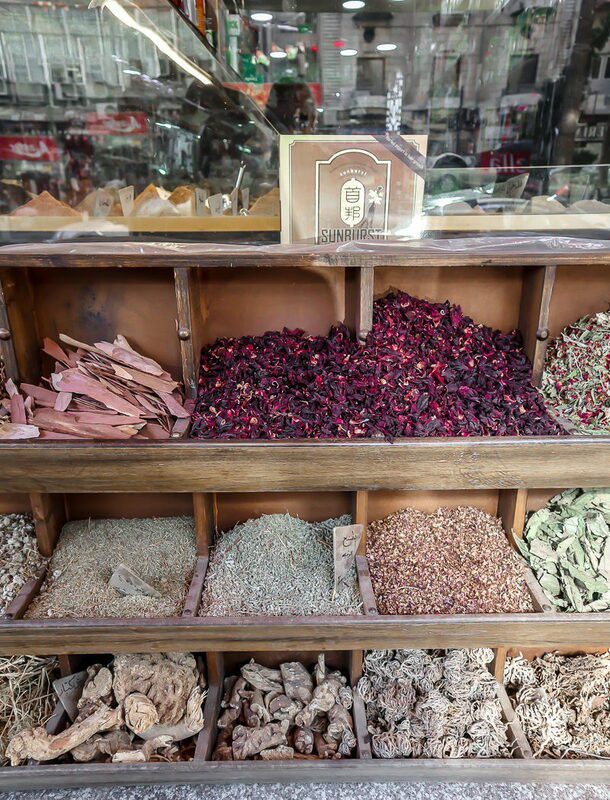 Souk el-Atareen is a great place to buy spices and various herbs – as far as I understand, some of them are part of local alternative medicine products. 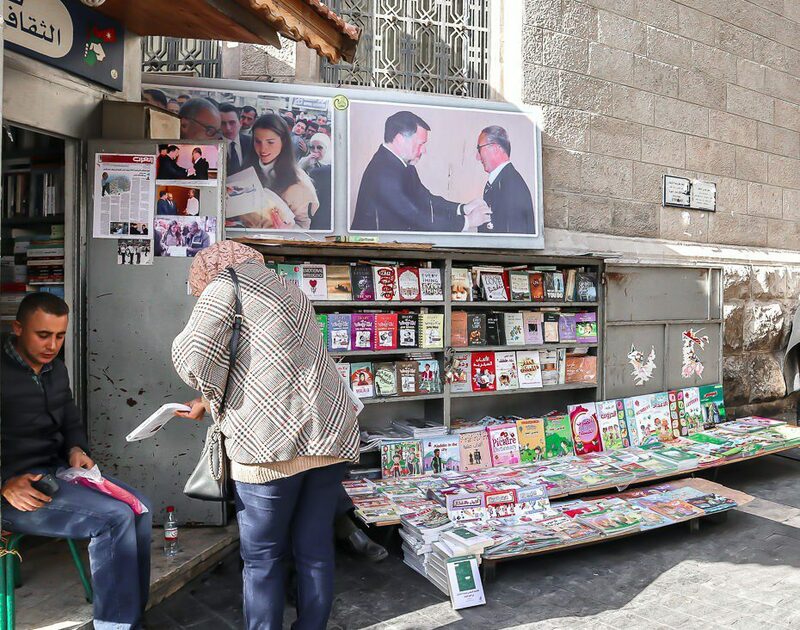 Souk el-Koutoub is a place for all the book lovers. 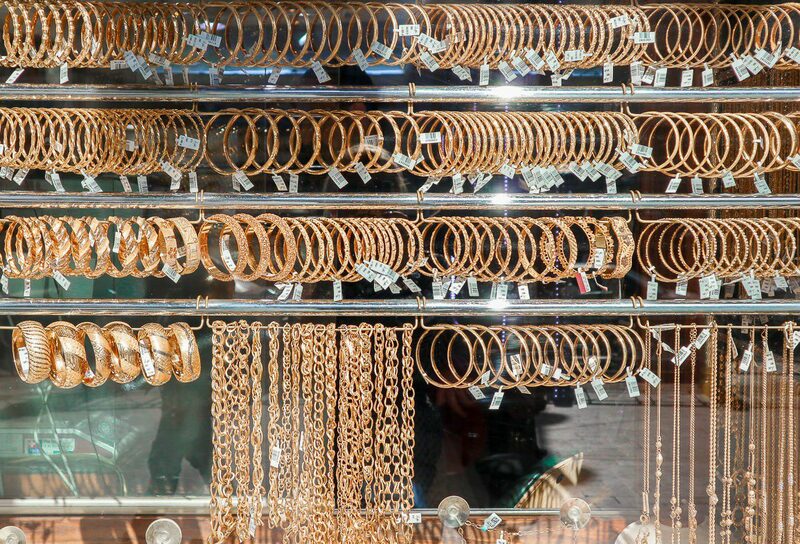 Try not to get blinded at Souk el-Sagha because it’s all about gold jewelry! 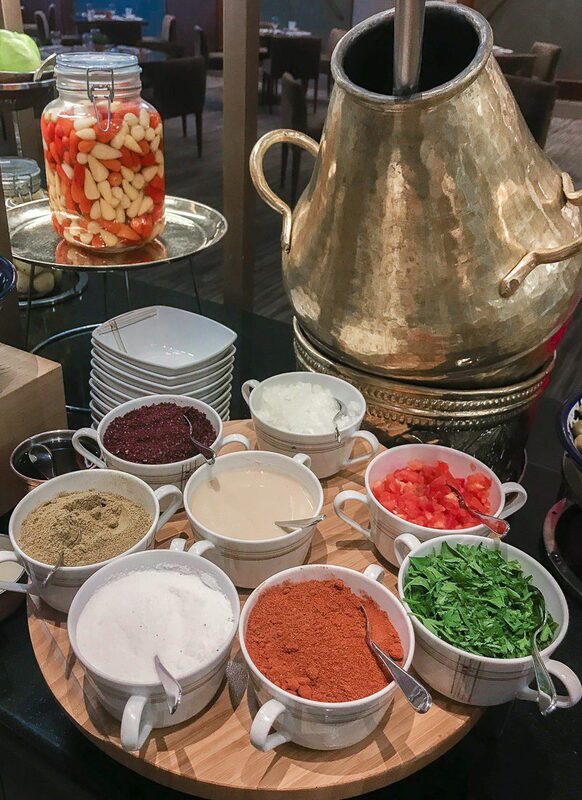 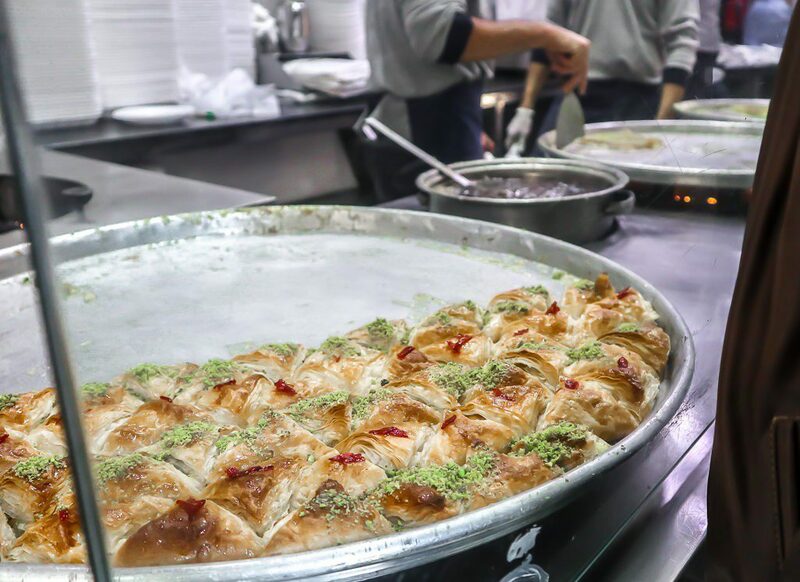 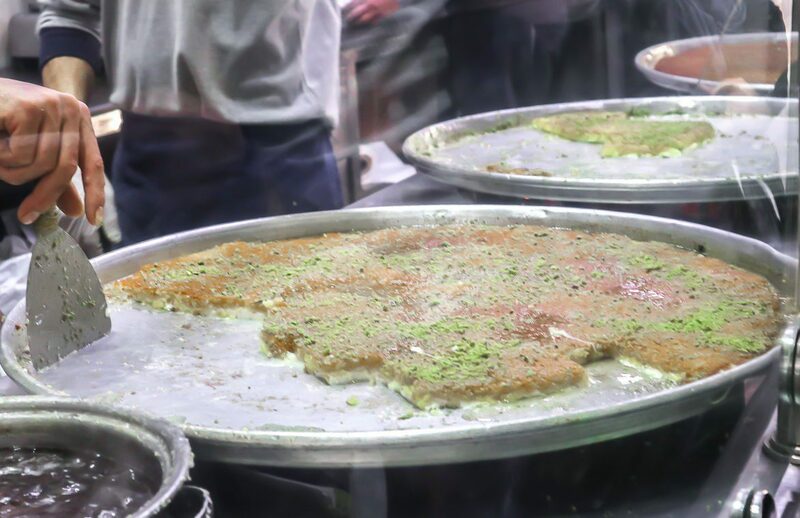 Knafeh (can be spelled as kanafeh, kunafah etc) is a cheese with the sweet thin noodles on top.It’s a delicious Palestinian dish which became the favorite dessert of all Arab world – and you have an opportunity to try one of the best versions of it in Amman! 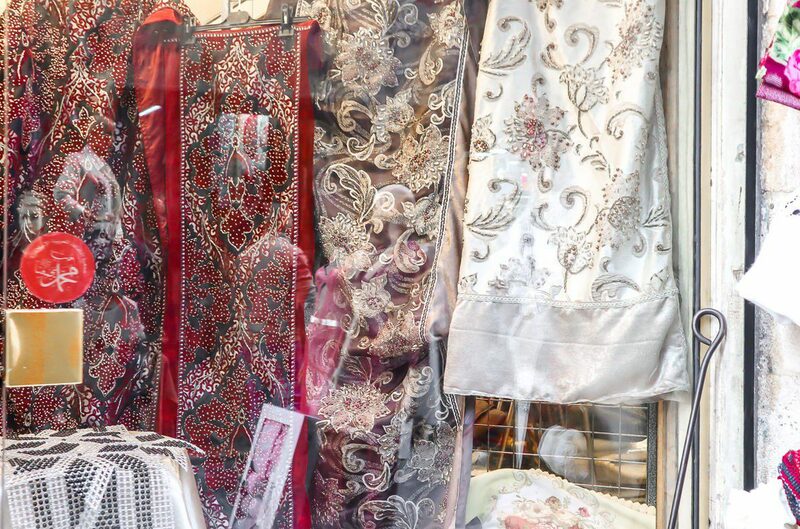 Actually the history behind this shop is distinctive. 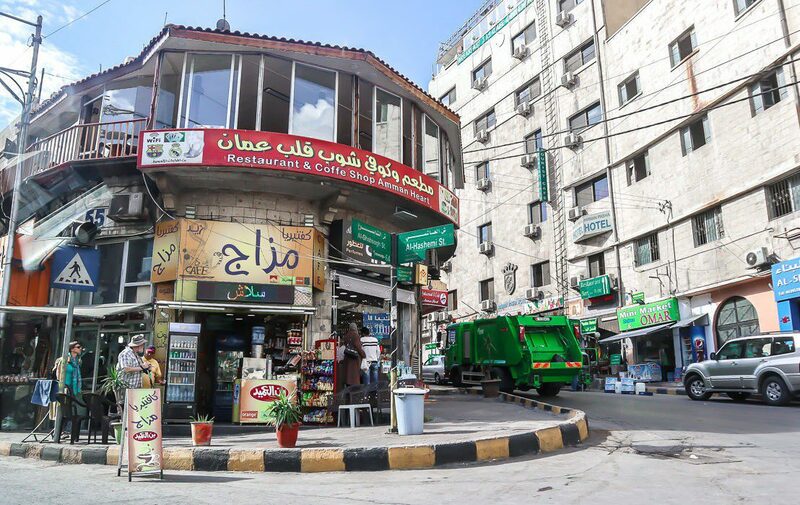 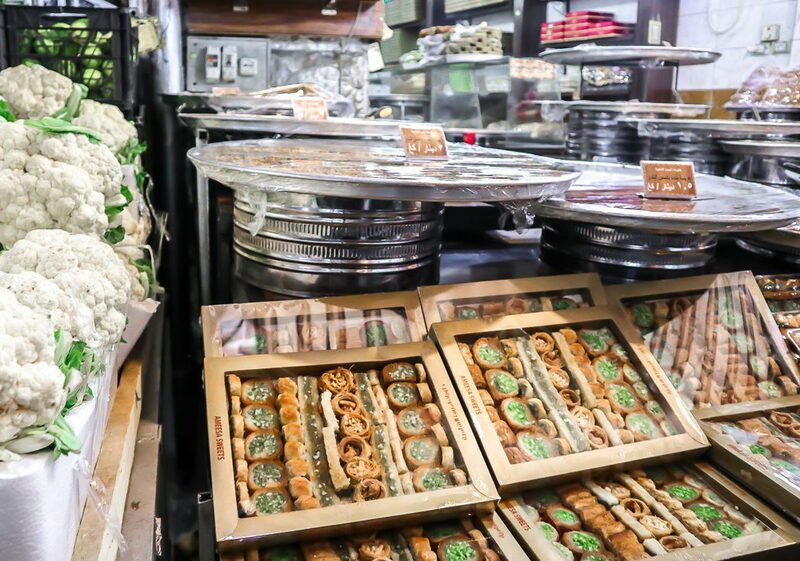 It’s run by Habibah family – in 1948 Al-Haj Mahmoud Habibah, originally from ancient city Nabluh (now West Bank), moved to Jordan and later established his knafeh shop in Amman. 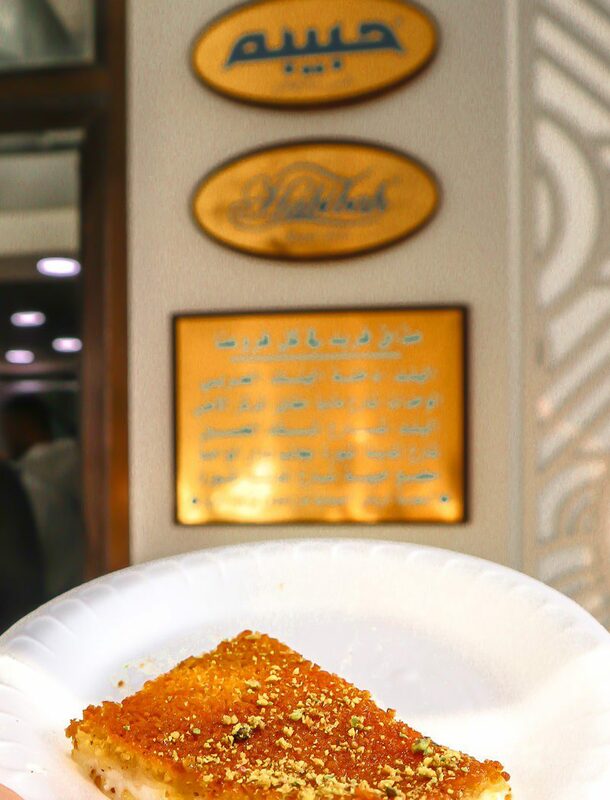 Now it’s definitely one of the most well known places to taste khafeh both for locals and tourists!Look for the Habibah signs in downtown – it’s a tiny kiosk where you can buy one out of two versions of famous dessert and a water for take away or to eat it straight from the plate on the street because there are no chairs or tables over there. 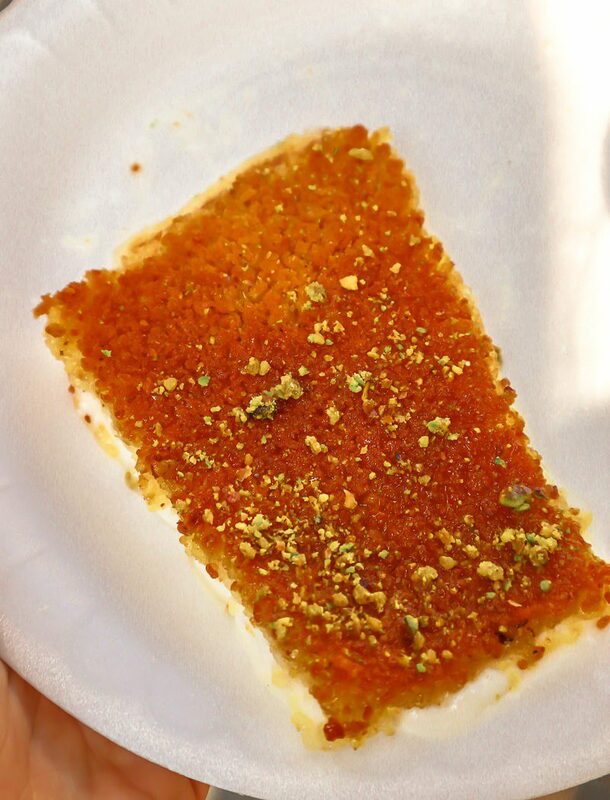 But although being not glammy as only possible, Knafeh is a must-try! 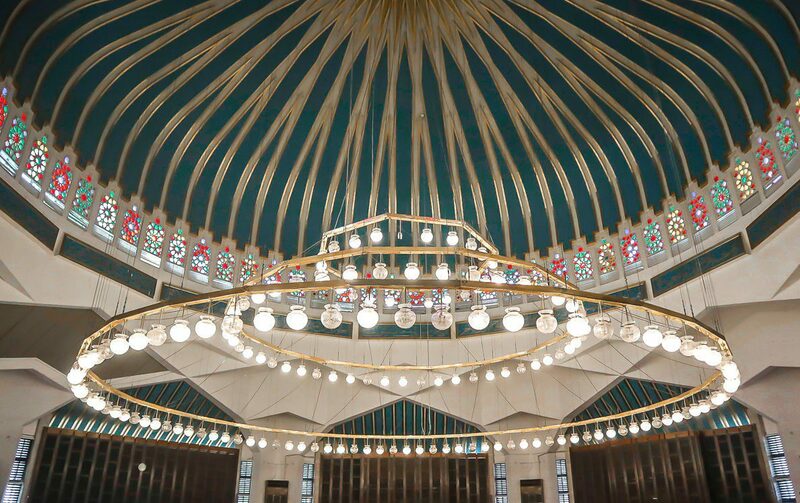 Unfortunately, unlike the King Abdullah Mosque, King Hussein Mosque is not open to general public – but you can still explore it from the outside. 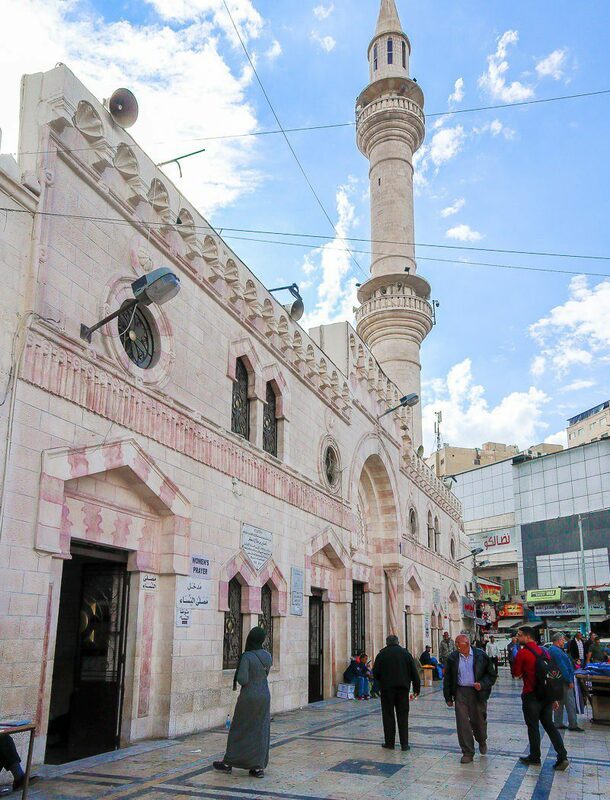 Right in the heart of the downtown and surrounded by different markets, this pink-and-white facaded building is one of the oldest and the most important mosques in Amman. 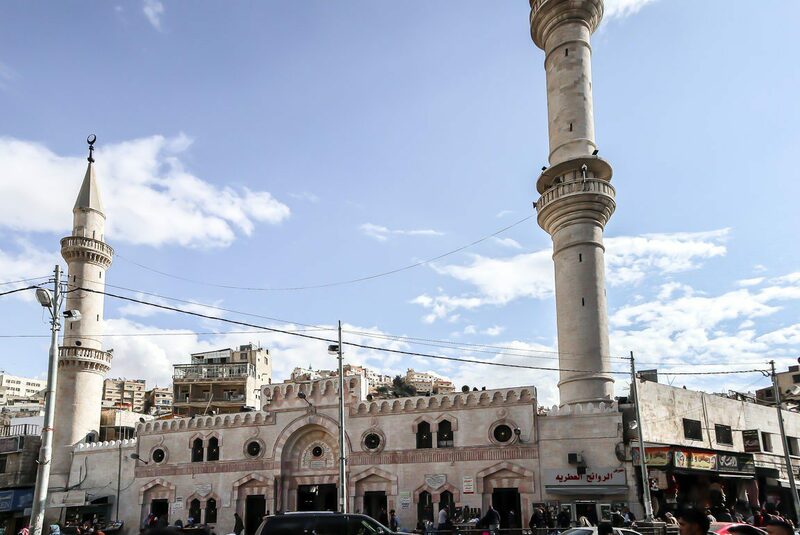 The current mosque dating back to the 1932 stays on the place of an ancient mosque of the 7th century AD erected by the order of Umar Bin Al-Khattab. 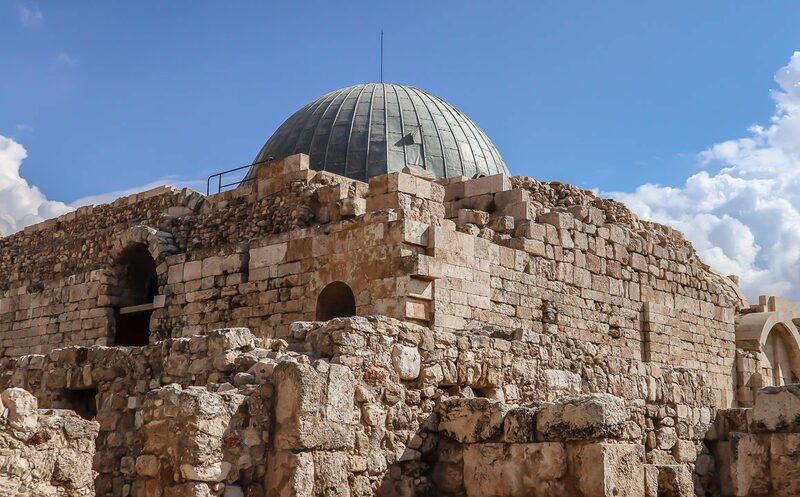 He was the second Caliph who knew prophet Muhammad personally, witnessed the very beginning of Islam, and played a great role in the Muslim history. 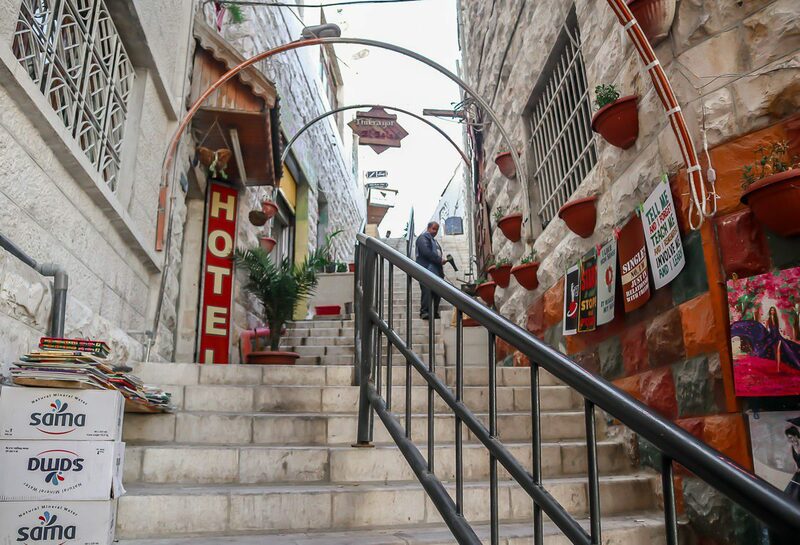 The Rainbow Street, straight uphill from the downtown, is a nice place with many restaurants and cafes around. 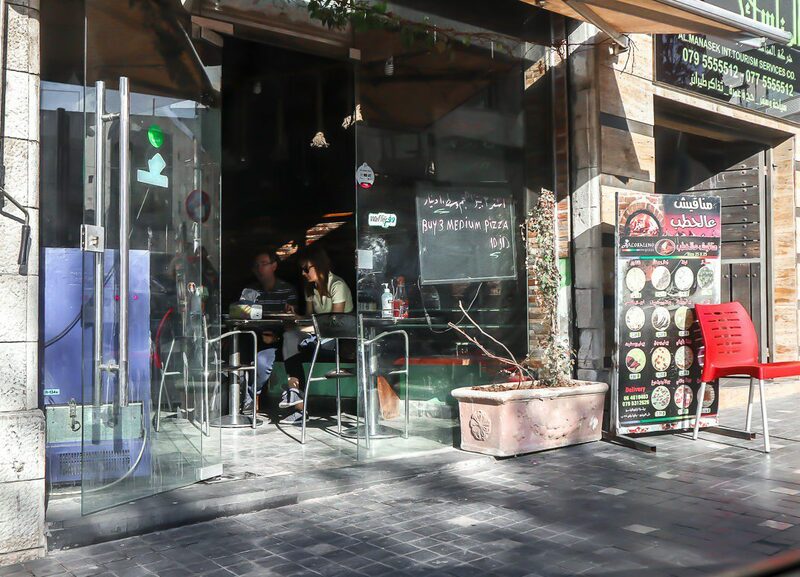 Unfortunately, we’ve been there at noon and it’s said that this area is at its prime in evenings. 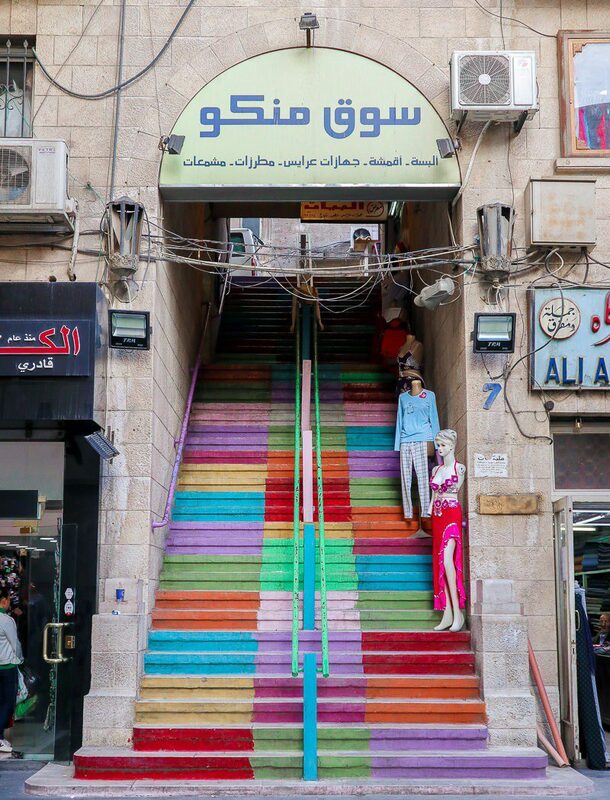 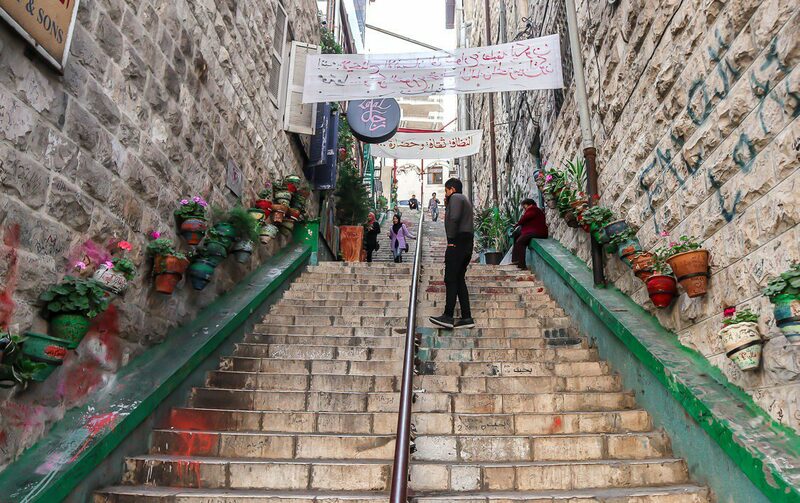 Interesting: the hill on which the Rainbow street is located is called Jabal Amman – and originally it was one of the seven hills that formed the city! 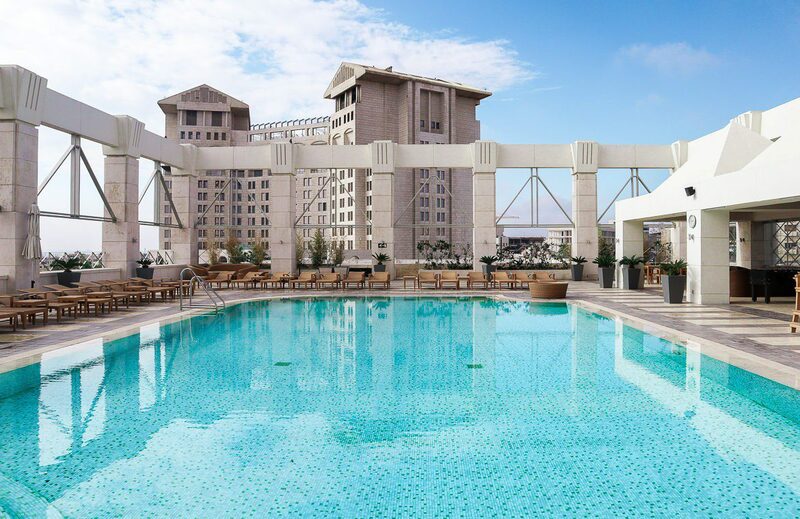 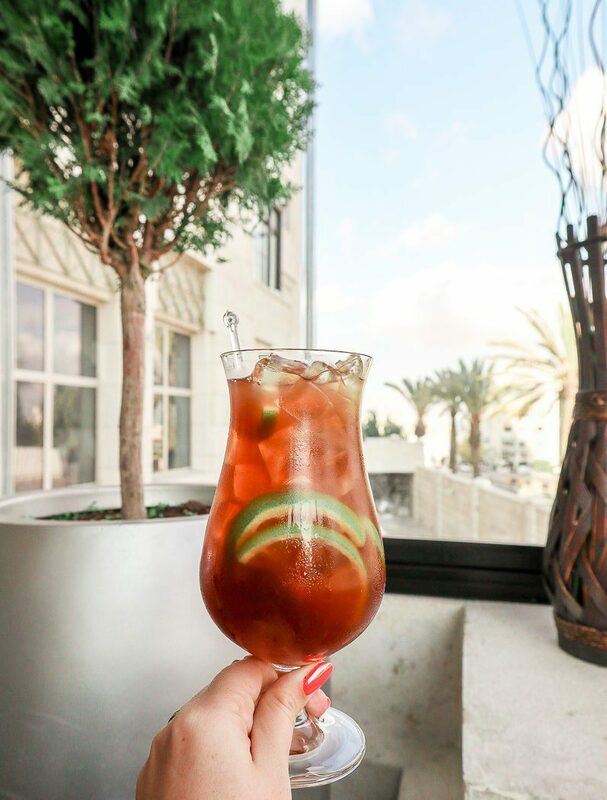 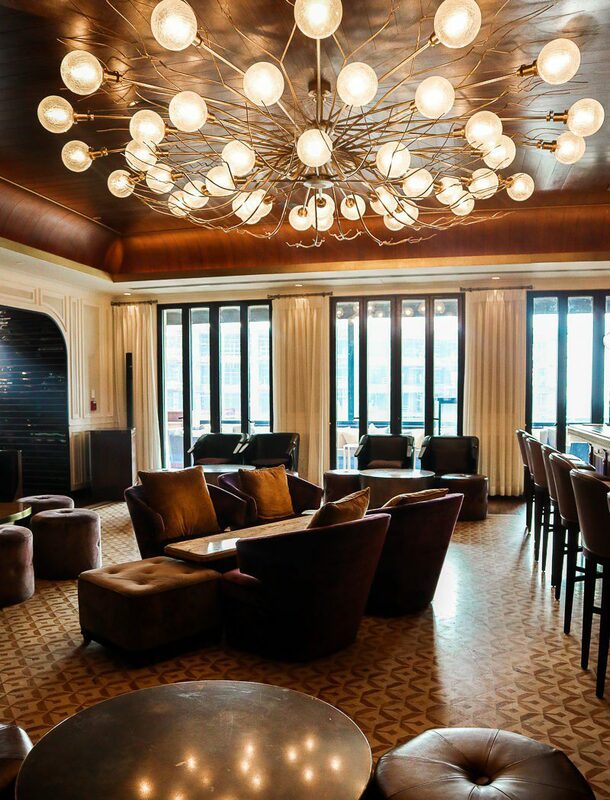 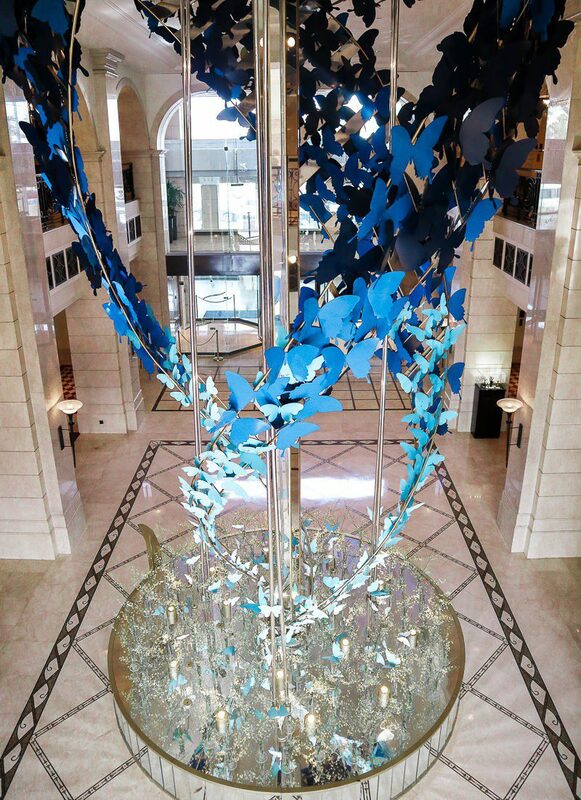 We stayed in Four Seasons Amman, 5-star luxury hotel – and it looks like it’s just the best hotel in the city! 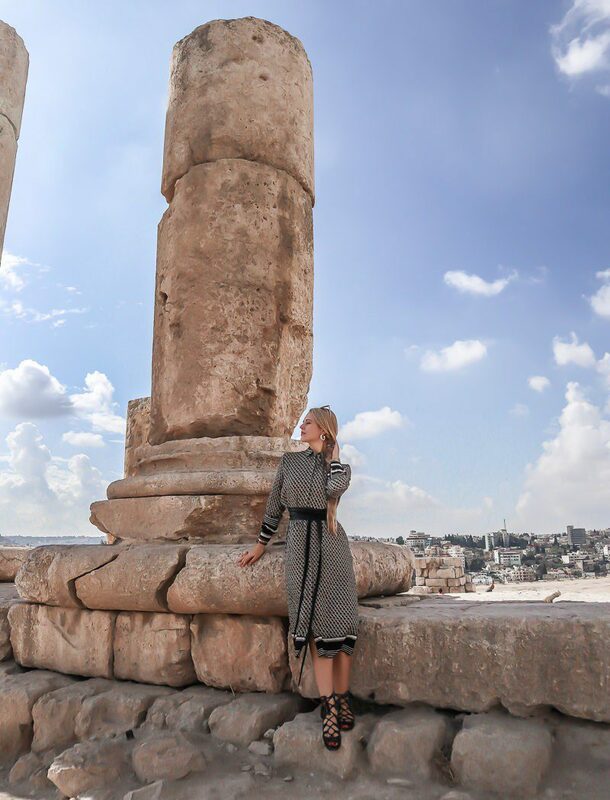 After long trips over Amman and to Petra it was a perfect place to relax and to enjoy traditional food and views over the city. 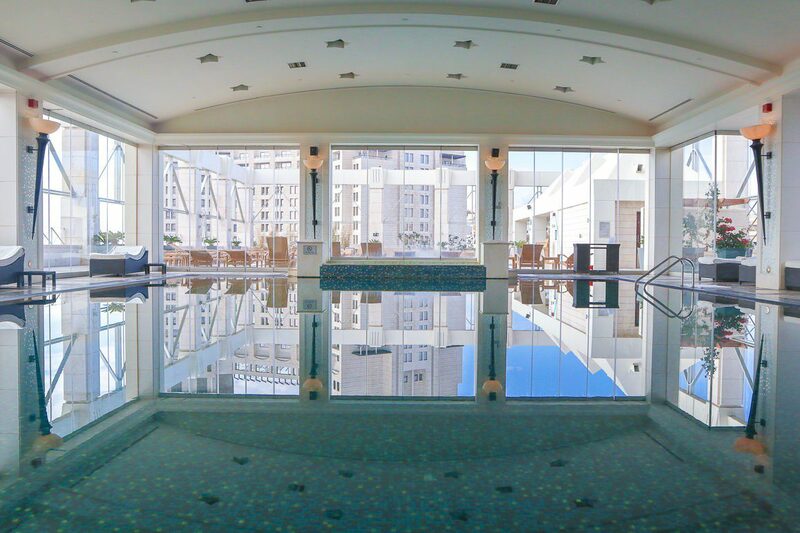 The only thing I regret was that I couldn’t stay there longer and to enjoy its SPA and pools to their fullest. 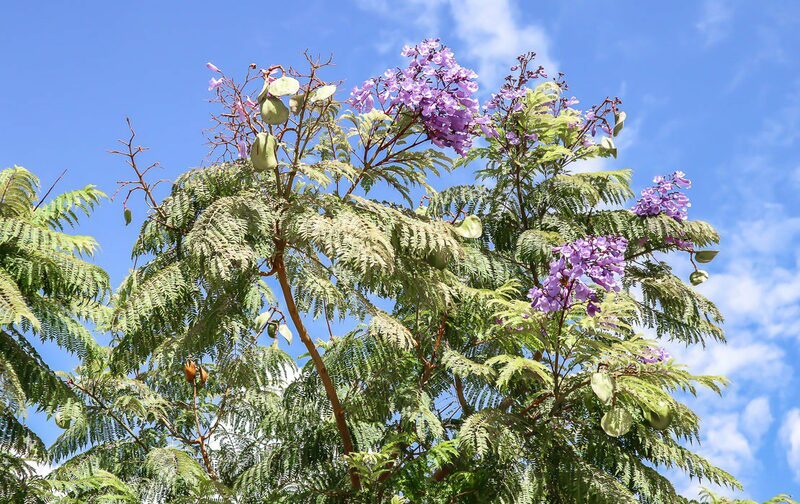 Hope you enjoyed my today’s blog!